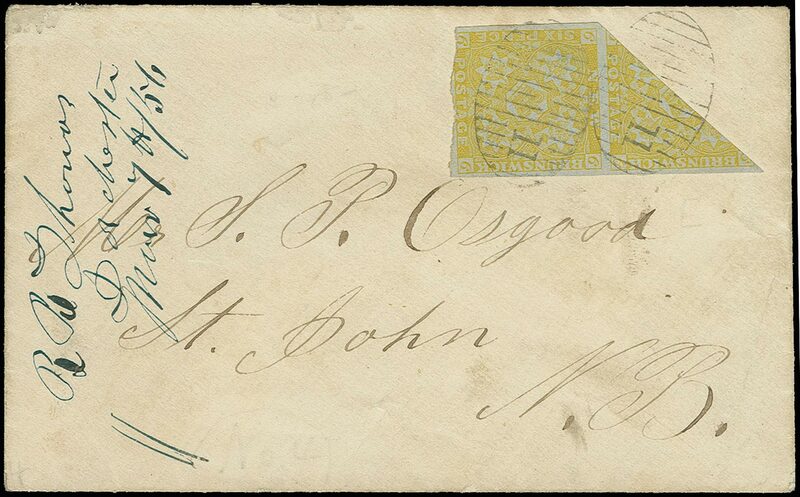 2b, 1851 6d Olive yellow, Diagonal bisect, tied by "29" grill cancel to envelope addressed to "Pleasant Valley/ West Cornwallis" Nova Scotia, backstamped St Martins AU 2 1858 dispatch with transit marks of St. John and Kentville; a Fine and rare cover as just 18 are recorded paying the ½d rate to Nova Scotia and just six of these using a bisected 6d; ex-Wilkinson, Hackmey, photographed in "Maple Leaves" Vol 29 No 1 (p 19); 1987 Greene Foundation certificate (identifies stamp as #2c) rnThe PMG never authorized the use of bisected stamps though it was tolerated probably as a courtesy to Nova Scotia's PMG who authorized the use of bisects in 1854. 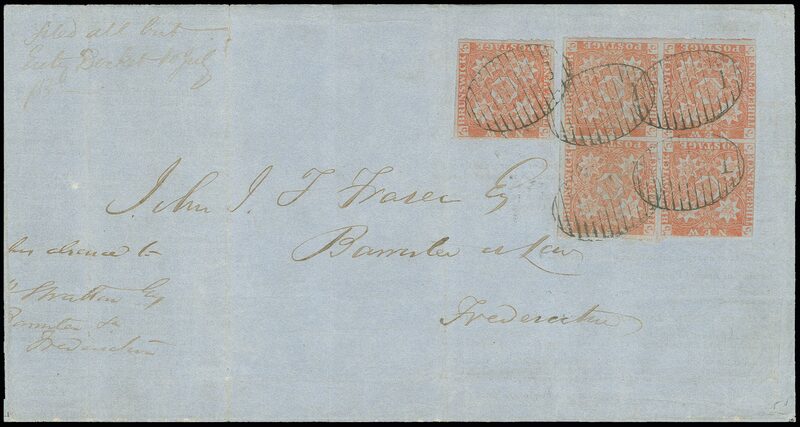 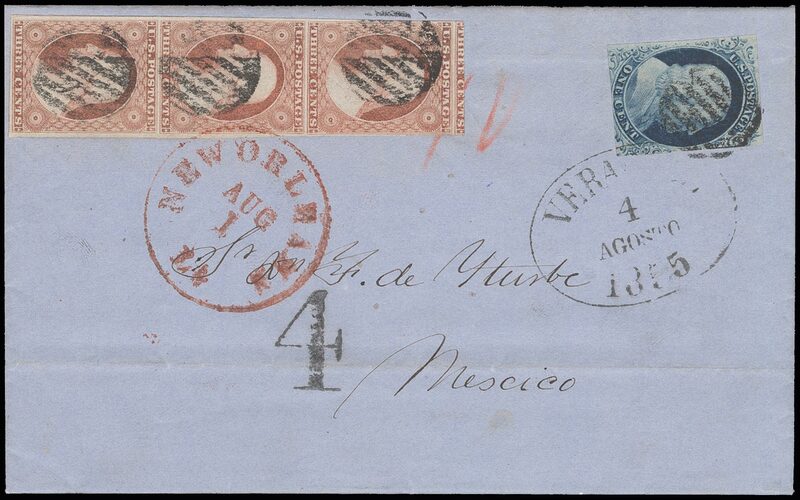 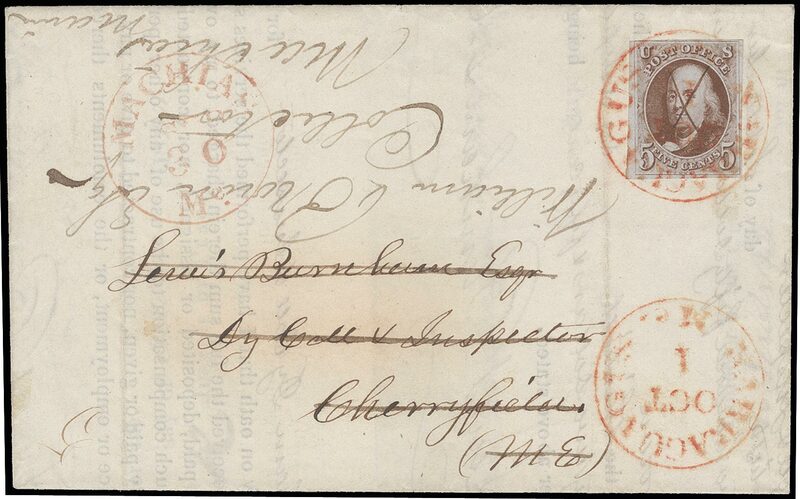 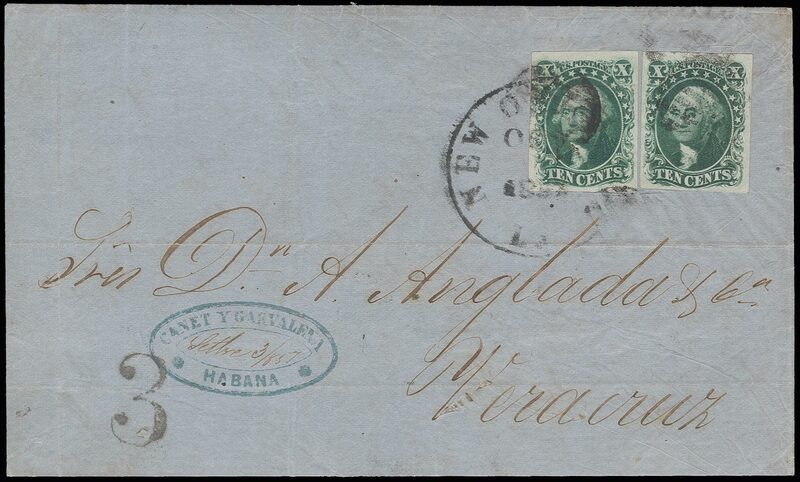 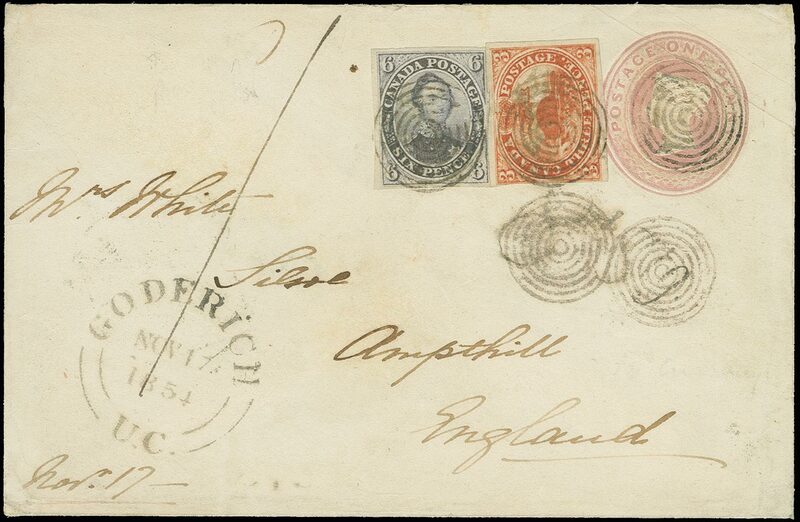 4, 1851 1sh Dull violet, horizontal pair and single plus diagonal bisect or trisect 3d Dull red, tied by "4" grill cancel to envelope dispatched from Bathurst (NO 14 1859 backstamp) and sent via London and Panama to Callao, Peru; franking with mostly good margins, touched in places, shilling-values small marginal tears and the 1d with nick; cover restored and pressed; a very rare franking and the only known cover from New Brunswick to South America, also the only recorded use of a 1 shilling pair on cover; ex-Seybold, Syracuse, Argenti, "Foxbridge", Koh , Wilkinson, Hackmey; 1999 BPA certificaternIt is believed that the sender intended to use the 3d. 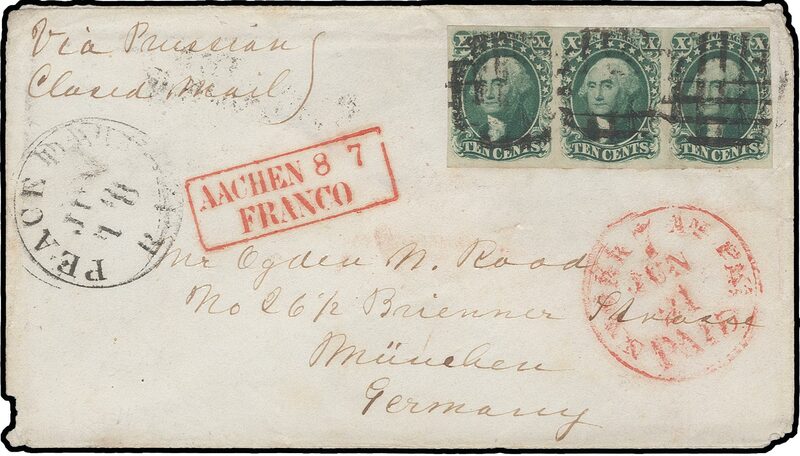 as a trisect to make up the 36½d rate with 37d franking as the closest possible way to fulfill this rate; assuming the 3d was bisected, the overpayment would be 1d. 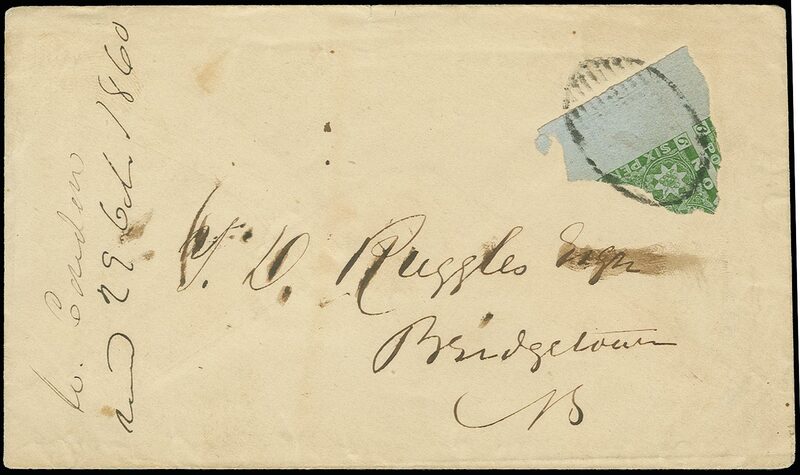 4 var., 1851 6d Yellow green, Quadrisect used as 2c, the quadrisect with a huge 12mm bottom selvage and portion of adjacent stamp tied by mute grill cancel on envelope locally addressed in Bridgetown (Oct 1860 dispatch backstamp), with front side notation "recd 29 Octr. 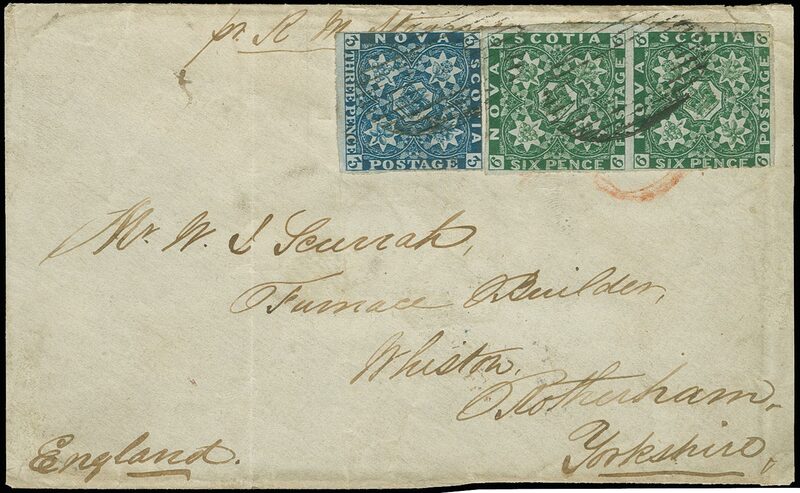 1860", Very Fine; only two quadrisects have been recorded in Nova Scotia philately and one of the great rarities in BNA postal history; ex-Wilkinson, Hackmey; 1969 RPS certificaternThe quadrisect pays the then current 2c drop letter rate. 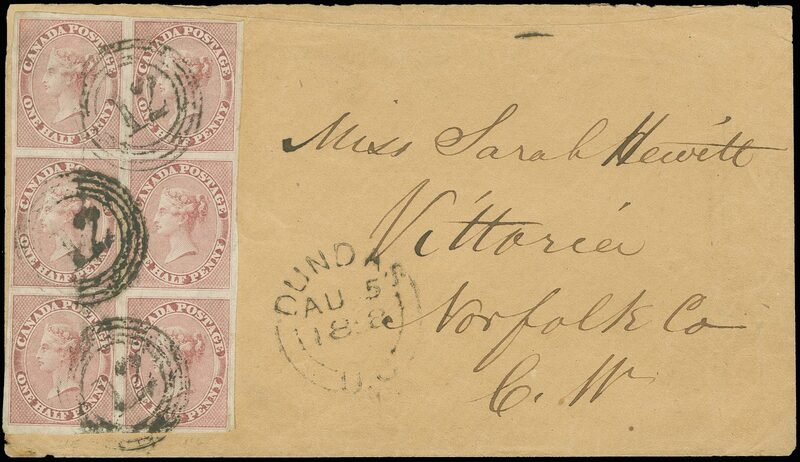 The Pence issues were never demonetized and several examples have been recorded used to pay the new rates in cents. 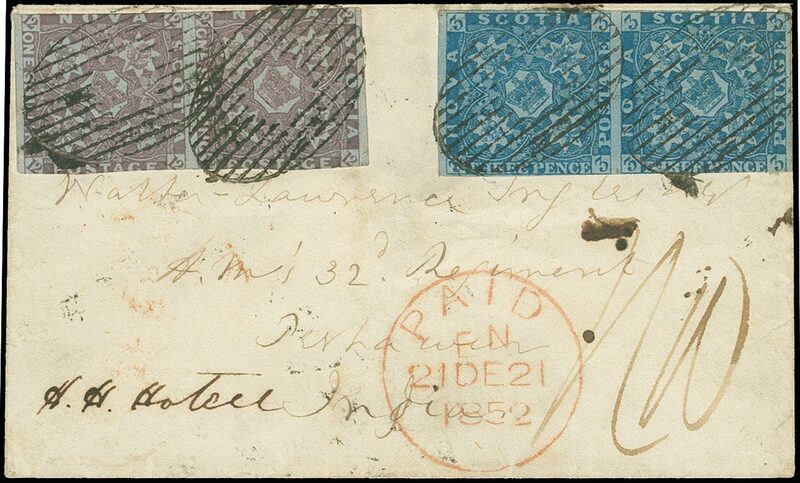 3a, 1851-57 3d Deep blue, Diagonal bisect, two diagonal bisects(different shades) tied by clear oval grill cancel to folded letter addressed to Pictou, backstamped Halifax JY 3 1857 dispatch, Pictou JY 4 1857, stamps partly cut into and one with two pre-affixing creases, a Fine and rare franking, only three such double bisect covers are known; ex-Wilkinson, Hackmey; 1998 BPA certificate stating "franked with halves of two different 1851-57 3d deep blue (SG 2) as a postal fraud"
12, 15, 1858 3d Red, 1859 5c Vermilion, 3d pos. 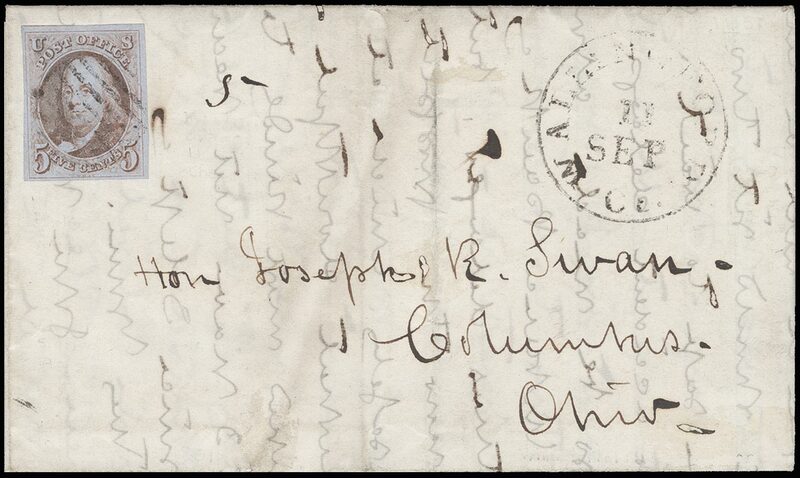 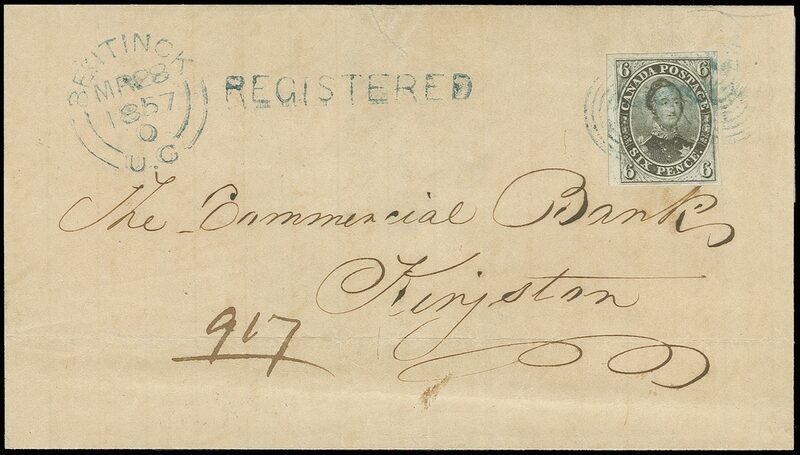 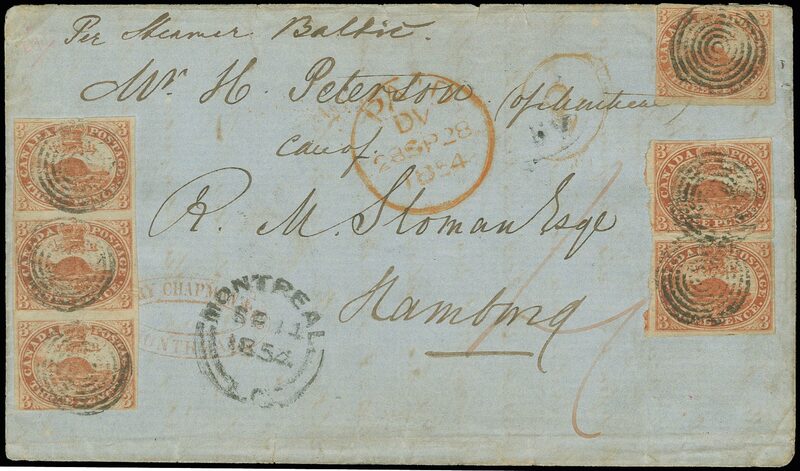 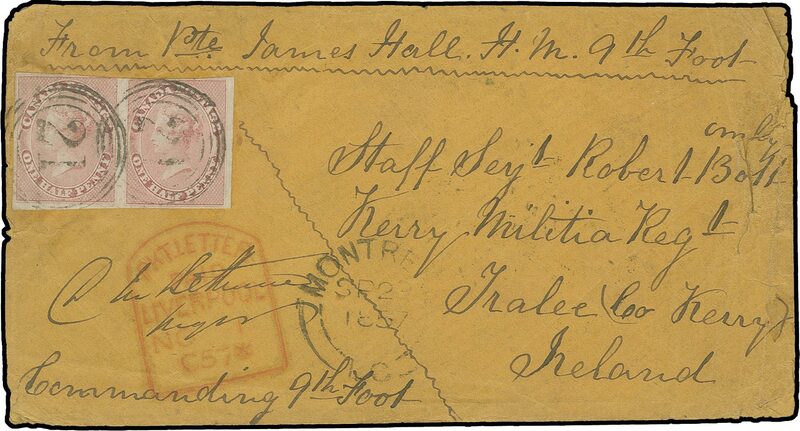 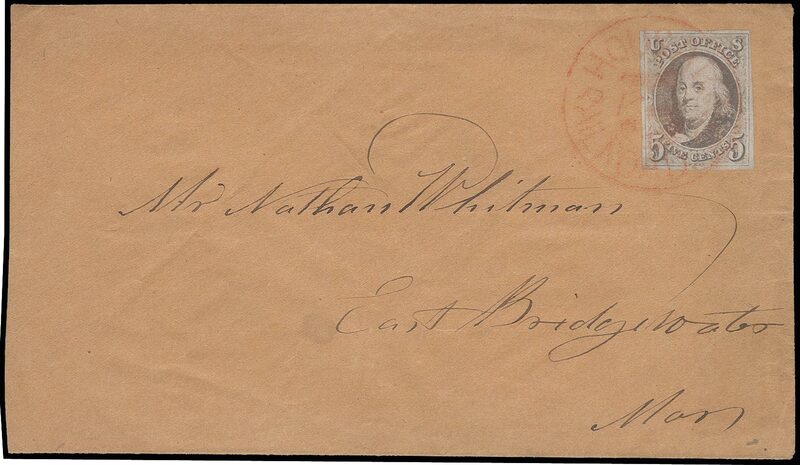 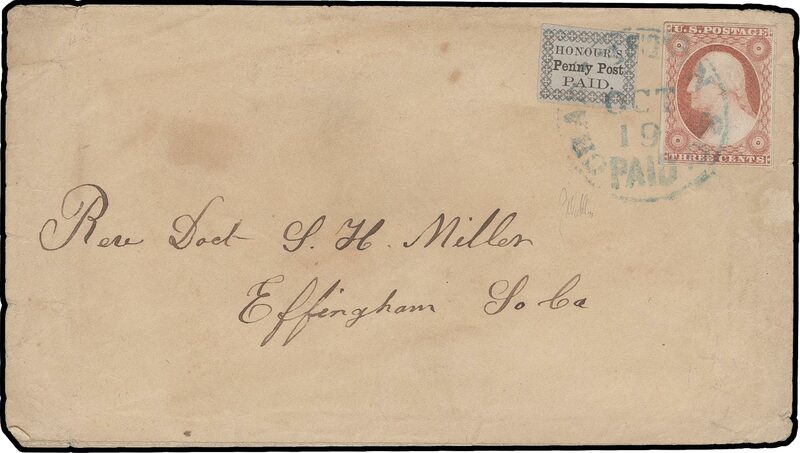 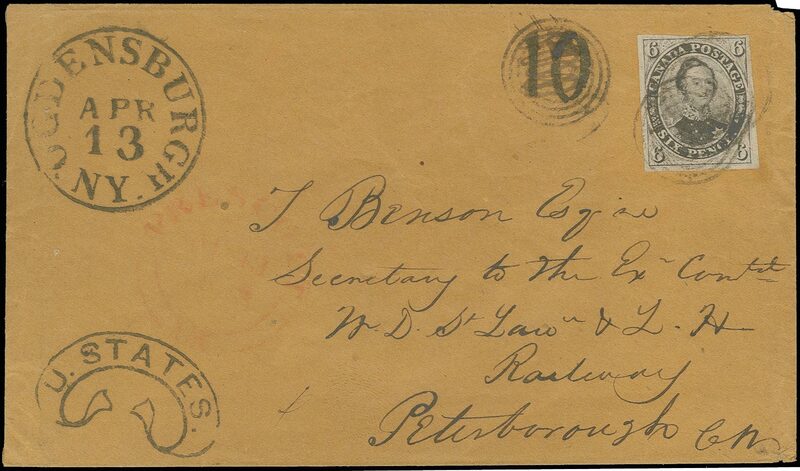 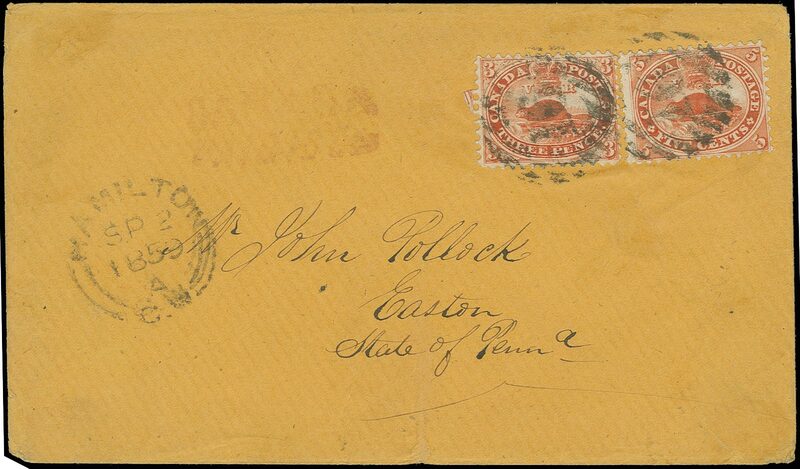 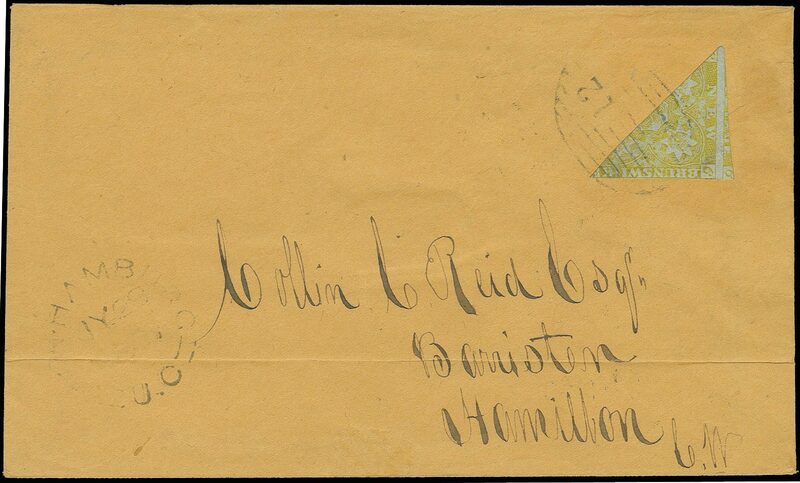 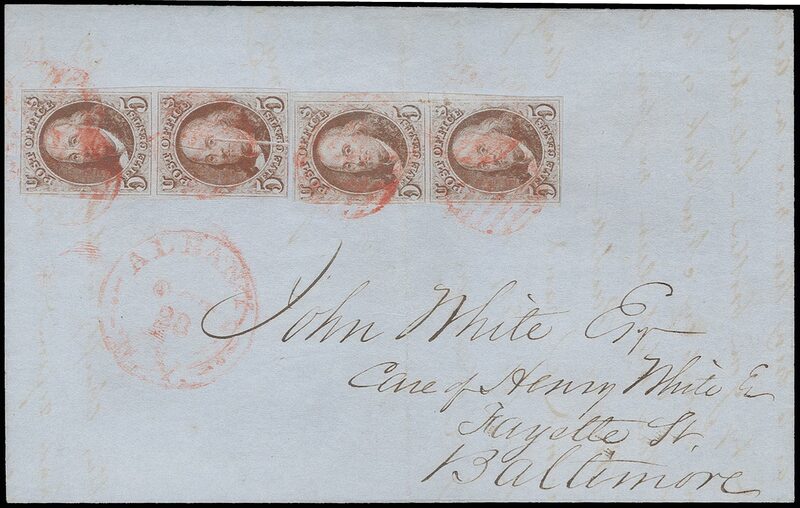 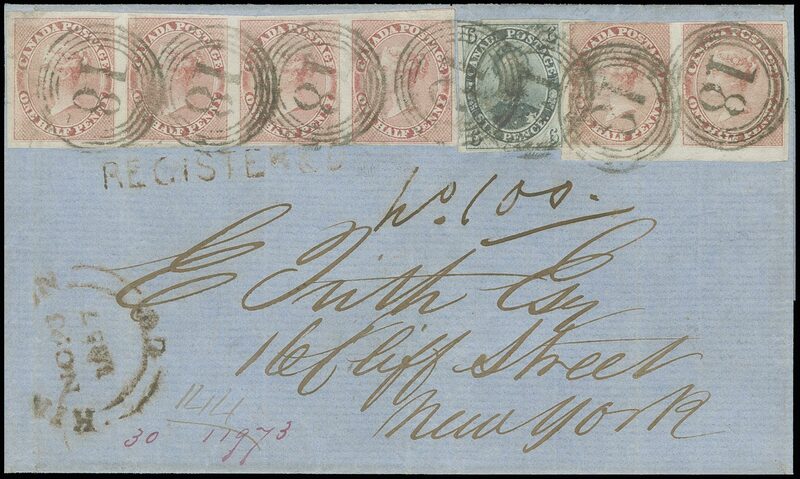 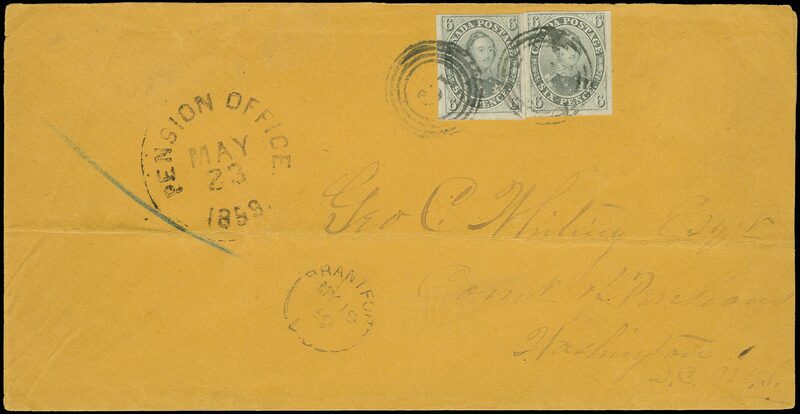 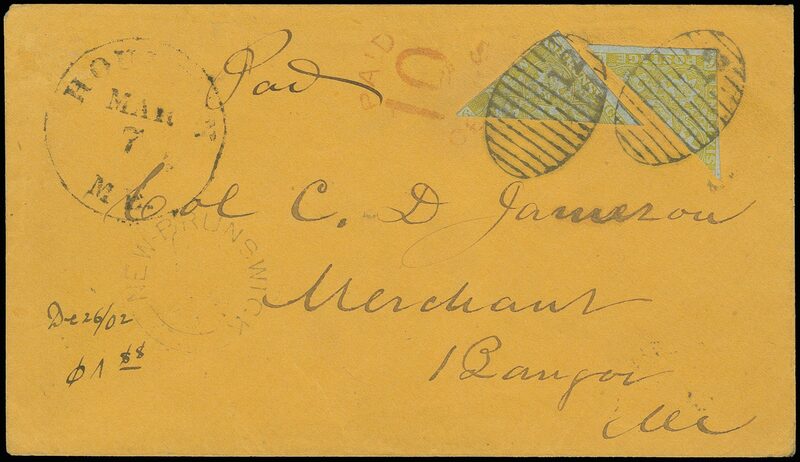 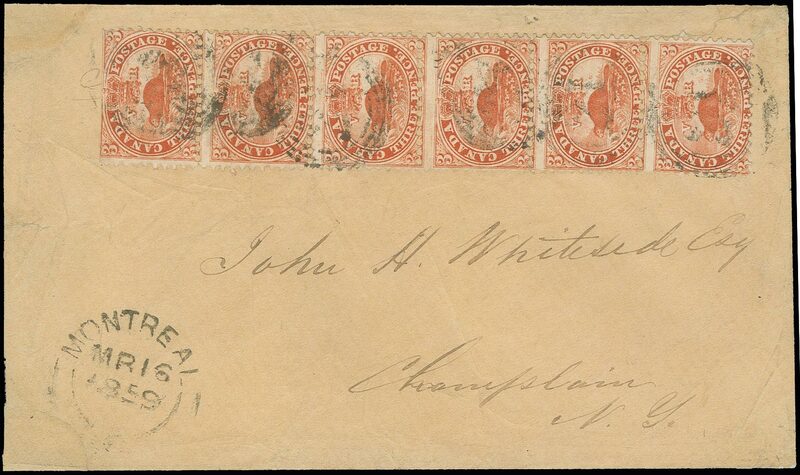 A47 with major re-entry in combination with 5c both tied by good strikes of circular grid "16" to envelope addressed to Easton Penn, adjacent Hamilton SP 2 1859 cds, lightly struck "CANADA PAID 10 Cts." 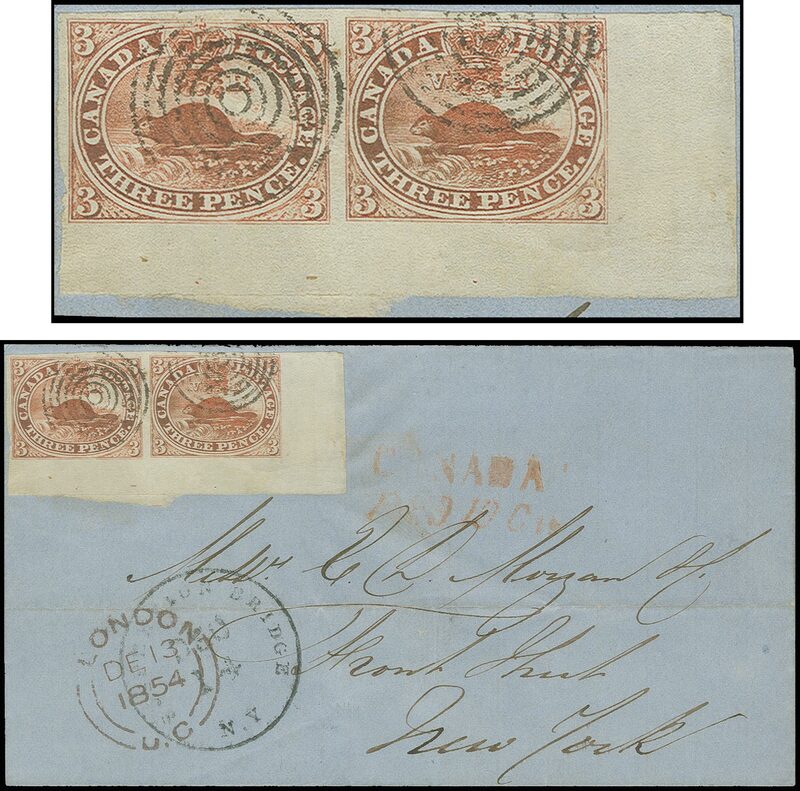 exchange handstamp, Very Fine; one of the great rarities of Canadian Philately and the finer of the two recorded mixed pence/ cents issue covers; ex-Dale-Lichtenstein, W.E. 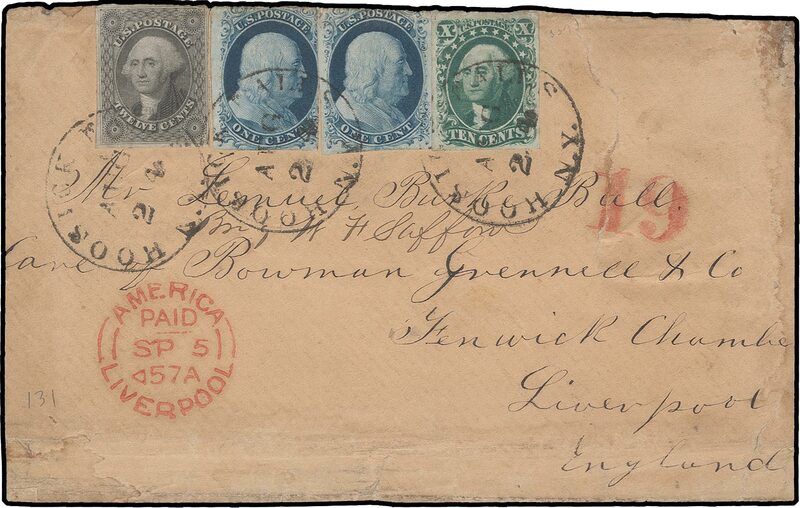 Lea, Carrington, Wilkinson, Hackmey (2011), illustrated in Boggs (p 204)rn1 July 1859 marked the changeover day from the Pence to Cents issues. 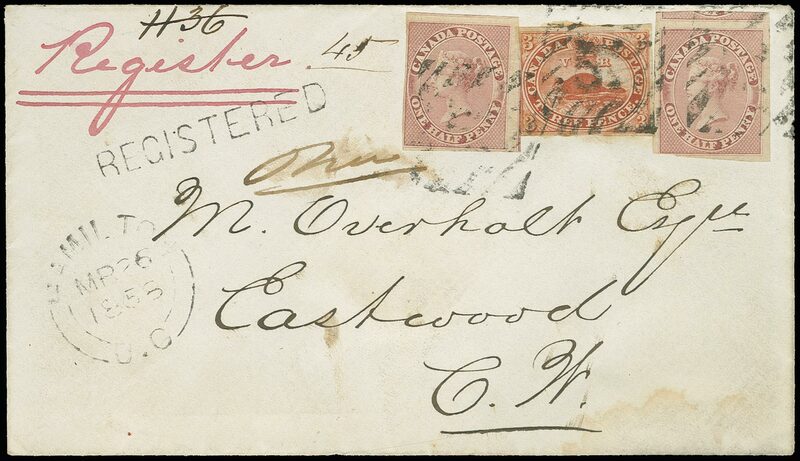 The Pence issues were not demonetized but the postmasters were instructed to return existing stocks to the PO Department on 1 July. 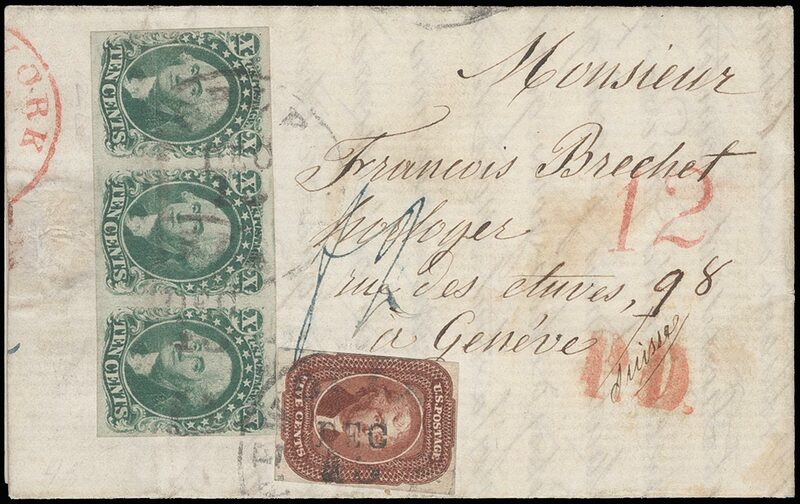 Some of the Pence issues remained in the hands of the public resulting in some combination frankings. 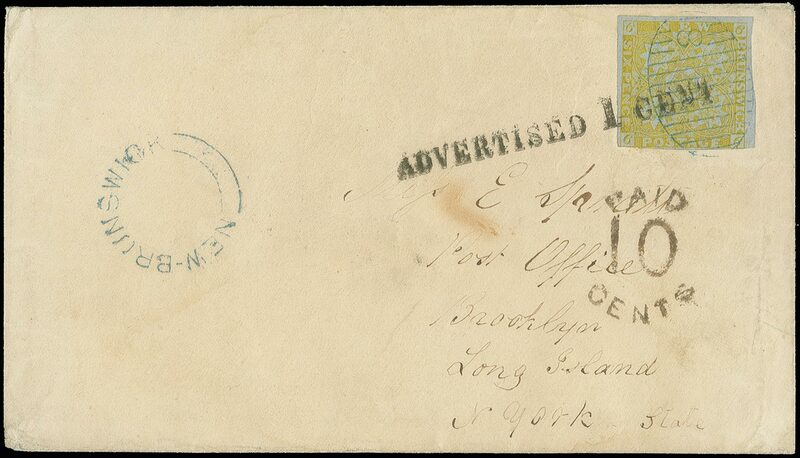 The PO Department issued instructions to the postmasters directing them to allow such uses. 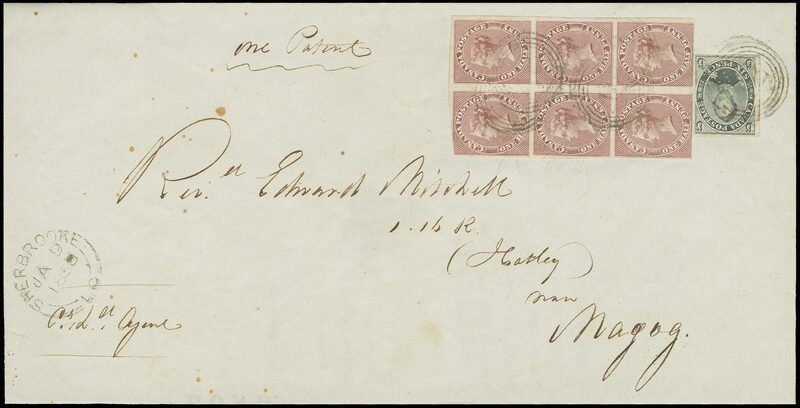 5, 1855 6d Slate violet, together with 3d Red (Scott 4) tied by target cancels to 1d Pink GB postal stationery envelope addressed to England, adjacent clear Goderich NOV 17 1854 cds, "8 stg" due handstamp "cancelled" by two target postmarks, large ms "d1" (1d due) at left, backstamped London U.C., Liverpool, Ampthill (DE 11), the 6d good to wide margins, 3d clear to mostly wide margins except just touching at left, slight staining on cover and stamps removed, still a Very Fine and most unusual combination cover, only one similar item recorded; ex-Siverts, Wilkinson, Hackmey, illustrated in Arfken, Leggett, Firby & Steinhart (p 237) and in "Gems of Canadian Philately" (p 20); 1989 Greene Foundation certificaternApparently the sender was convinced this franking would match the 10d letter rate to UK by Cunard Line, which the postmaster apparently at first glance also accepted and stamped the cover "8d Stg." 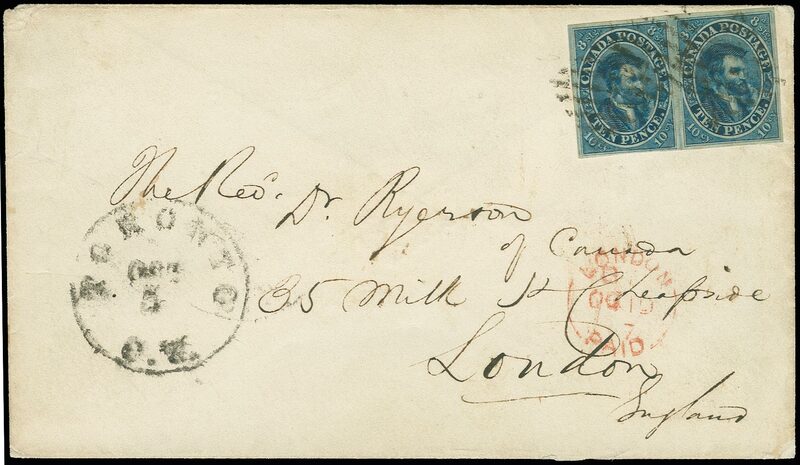 (= 10d) but then cancelled this marking by two strikes of the target cancel and rated the cover as "d1" due, not accepting the British envelope. 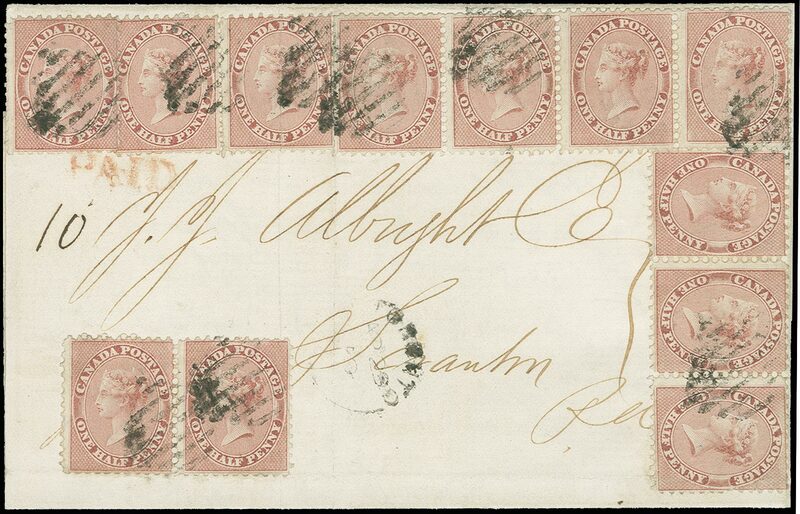 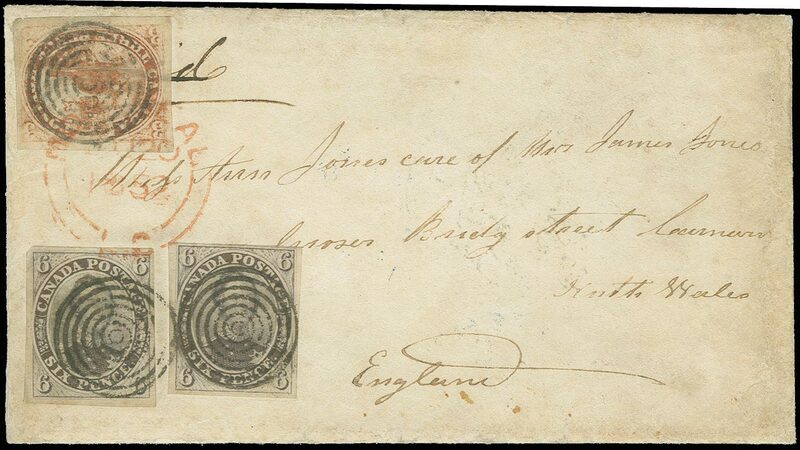 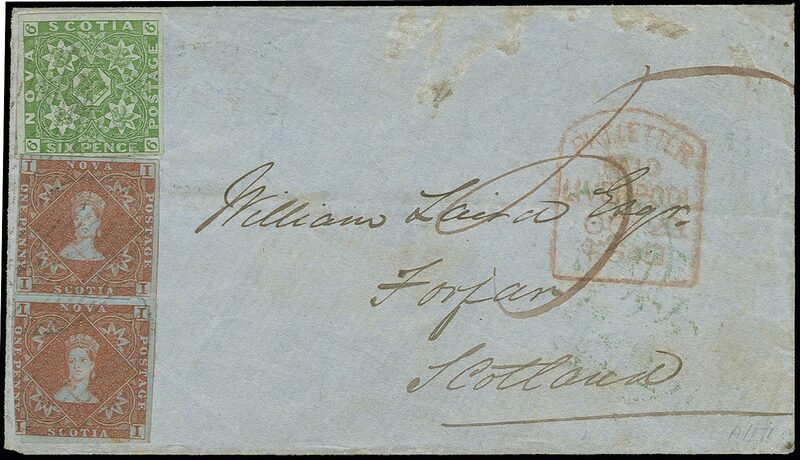 5 var, 1852/57 6d Reddish purple on thick soft paper, combined with 1857 ½d Rose (3 singles) and ½d Lilac rose single tied to envelope addressed to Scotland by several clear strikes of 4-ring "50" cancels, endorsed "via St. Lawrence" and "Prepaid", Windsor JU 5 1858 dispatch cds, backstamped Hamilton, Pkt. 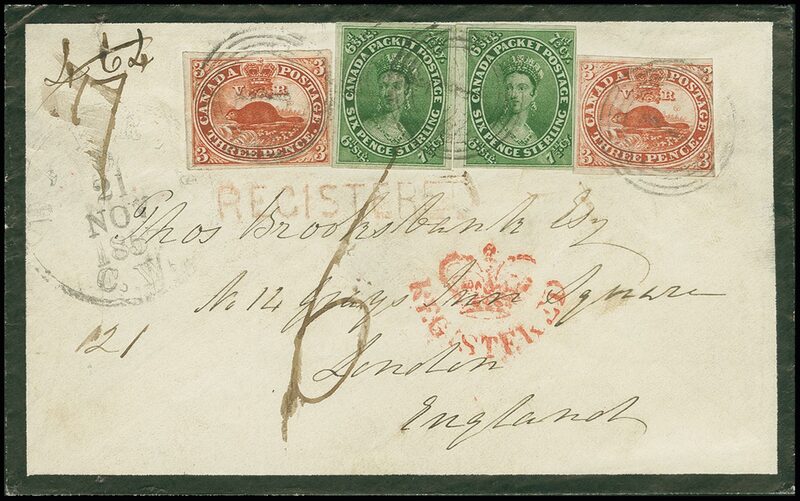 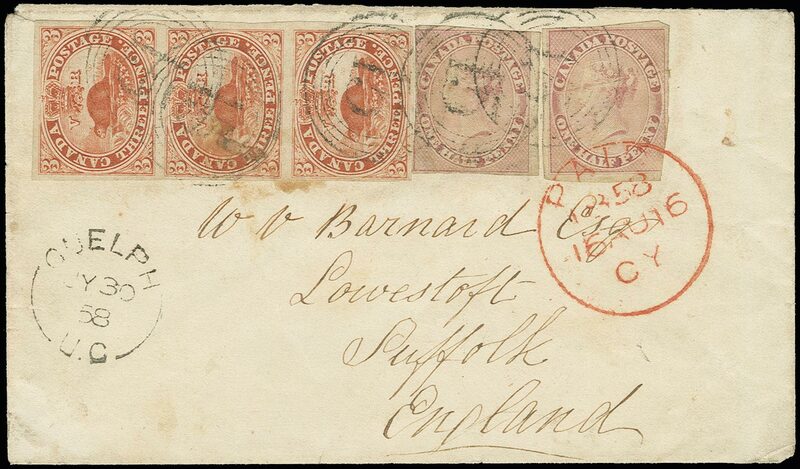 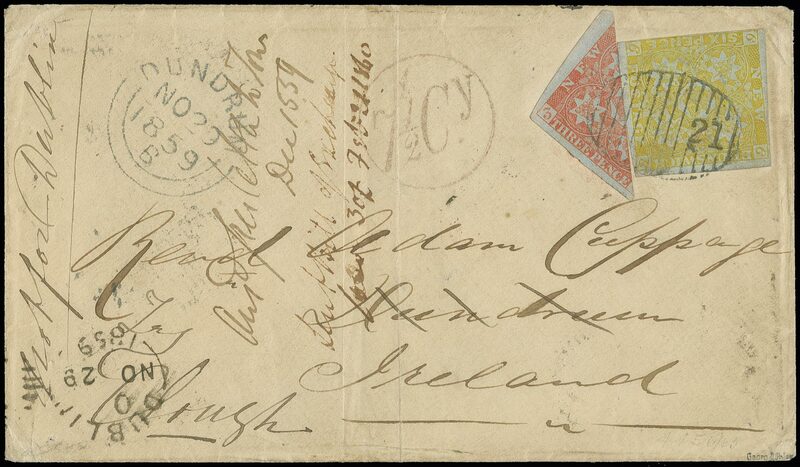 Letter Liverpool, Edinburgh and Peebles arrival (JN 21), slightly overlapping stamps with margins to cutting, ½d Lilac rose lifted for inspection and replaced by hinge; the ½d Rose stamps pre-use creasing, A unique short-paid franking; ex-Nickle, Wilkinson, Hackmey, illustrated in Arfken, Leggett, Firby & Steinhart (p 242) and "Gems of Canadian Philately" (p 32)rnCovers carried by the Canadian packet of the Allan Line via Quebec required 7½d postage (6d Sterling). 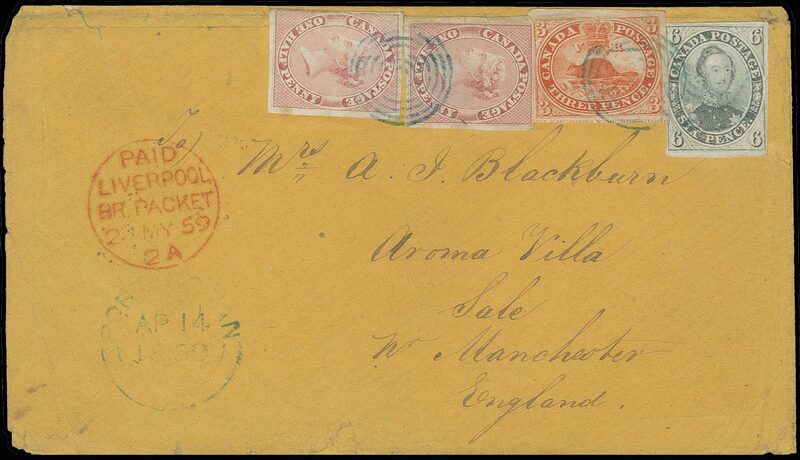 The postage for covers transported by British Packet (Cunard Line) via New York was 10d (8d Sterling). 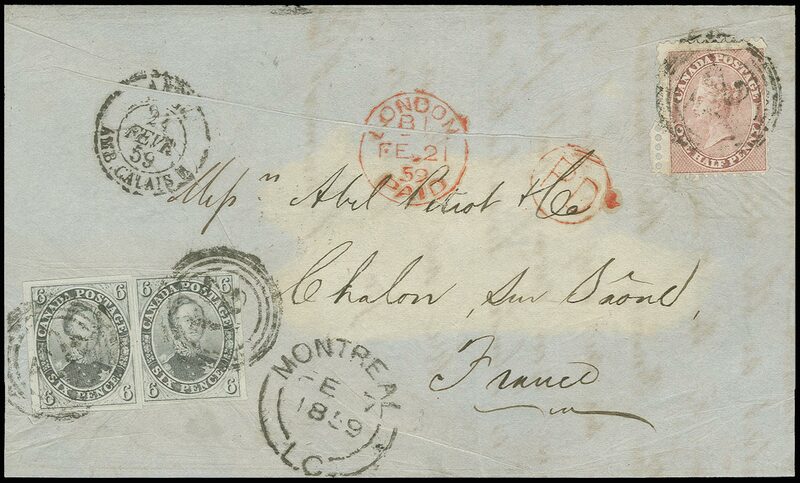 Apparently this cover was originally posted with 7½d but a mail clerk advised the sender that the letter would not catch the next Canadian packet and that additional postage was required to prepay the letter for the next steamer, it being the British packet (in this case Cunard "Africa"). 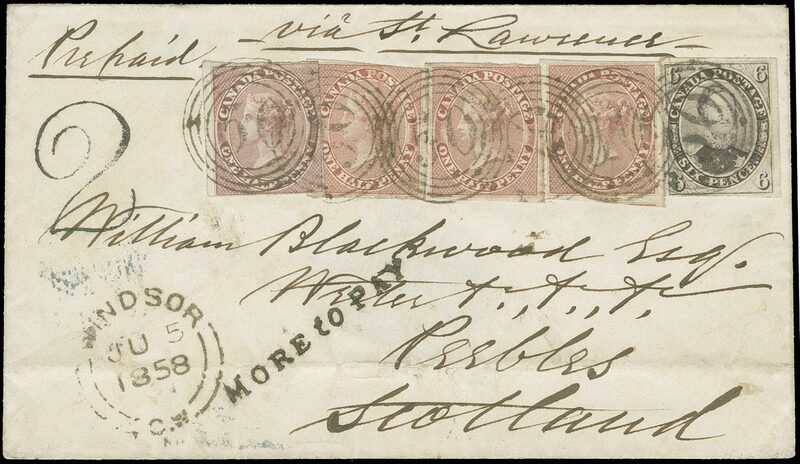 An error occurred when only and additional ½d Rose lilac was added making up the 8d currency instead of the 10d Sterling. 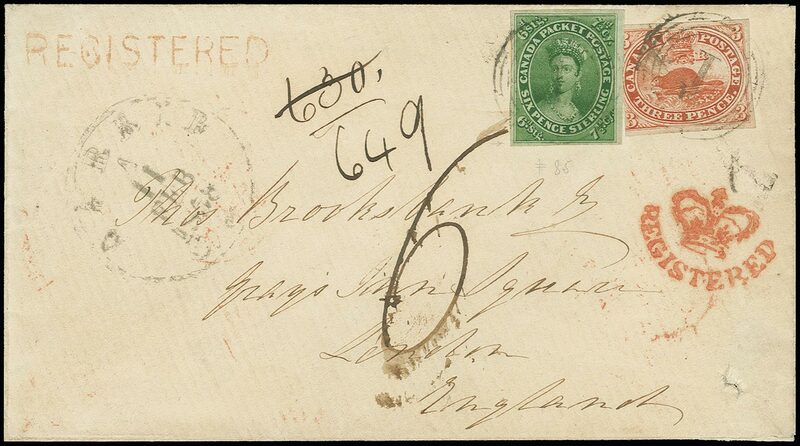 Thus for this route the cover was underpaid and accordingly taxed "2" with adjacent straight line "MORE TO PAY". 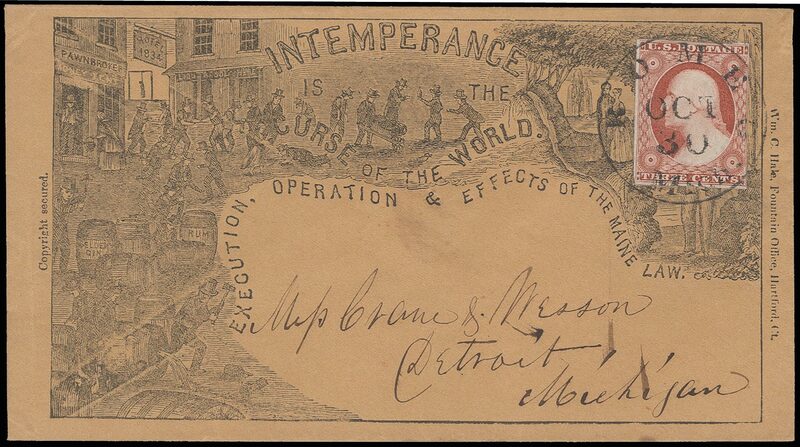 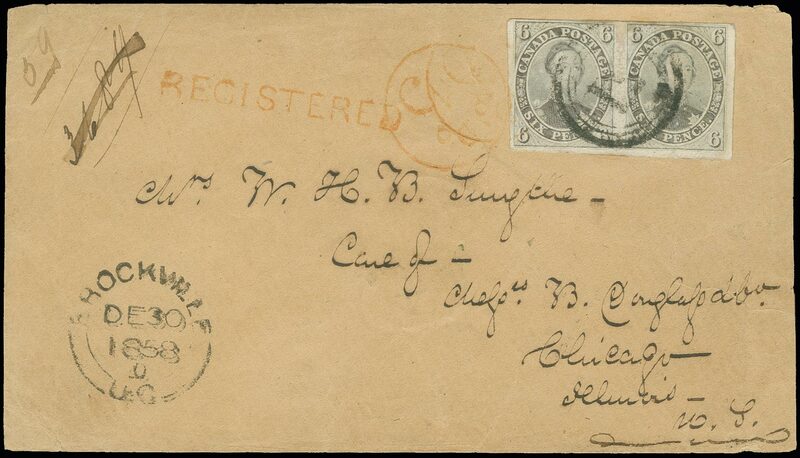 This is the only recorded cover showing compliance with the Post Office's "next packet" principle. 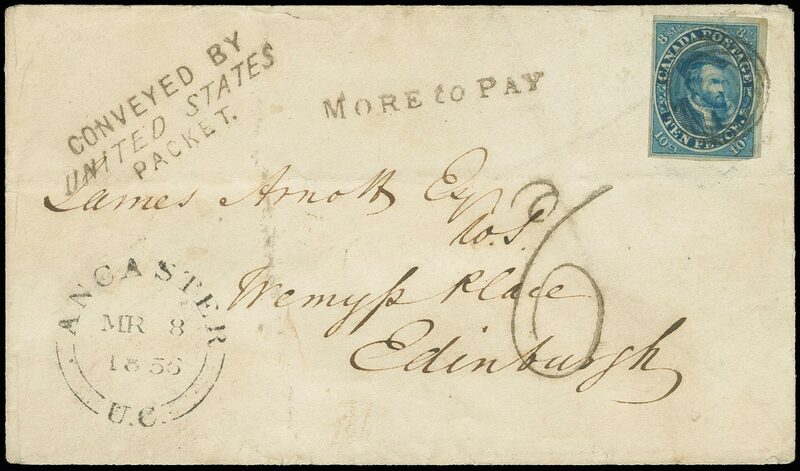 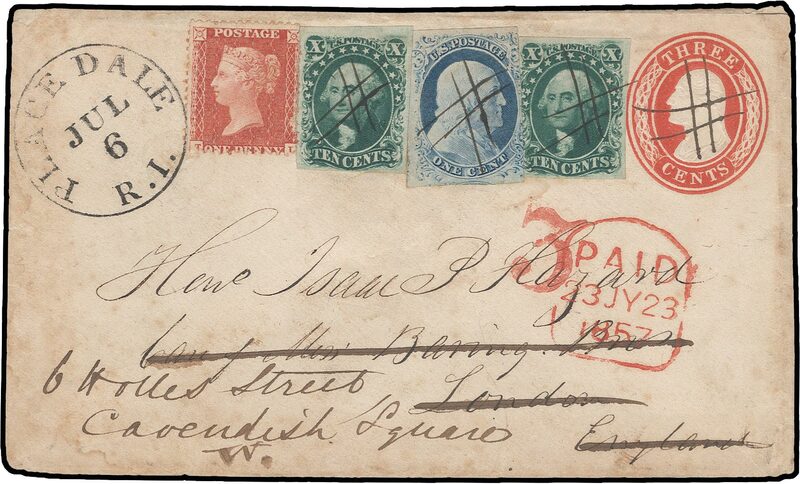 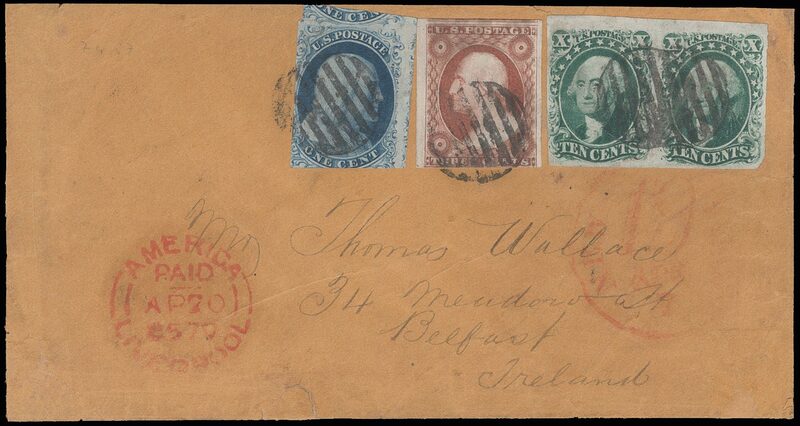 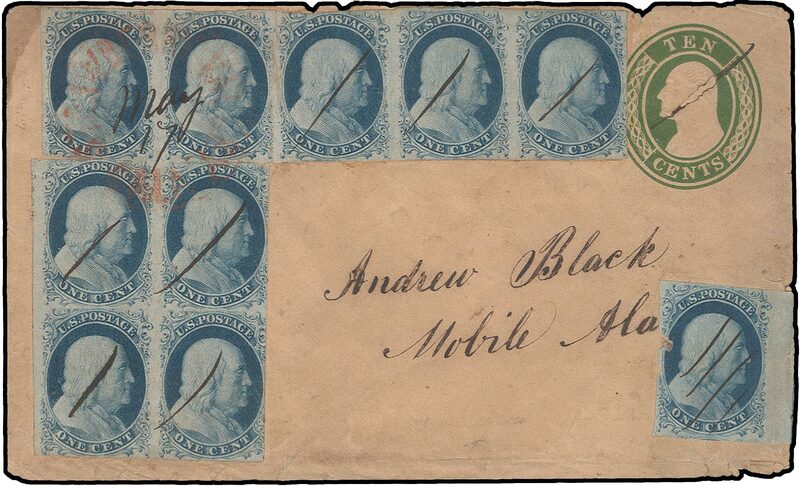 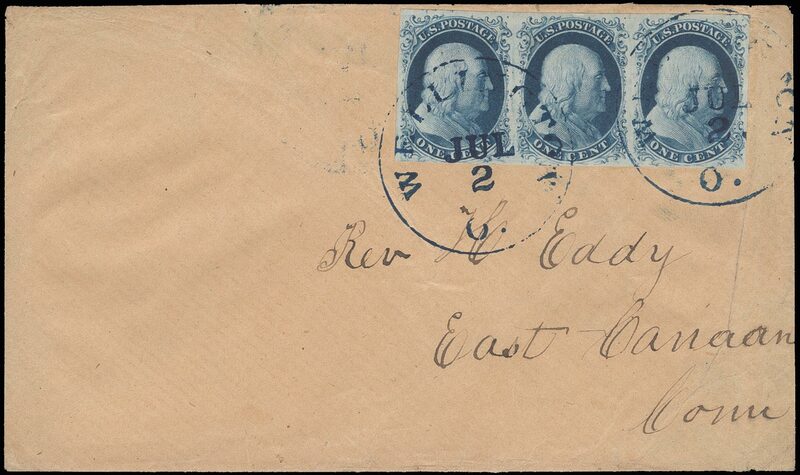 7, 1855 10d Blue, tied by black target cancel to envelope addressed to Edinburgh, Ancaster MR 8 1855 cds at lower left, nice strike of 3-line "CONVEYEDBY UNITED STATES PACKET. 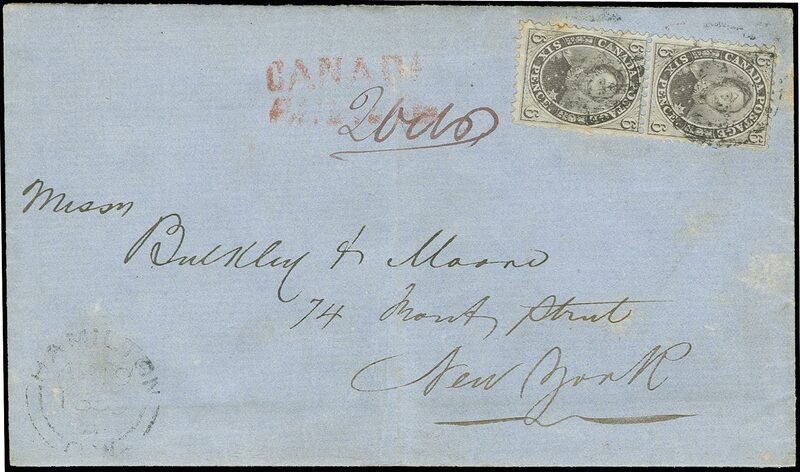 ", also black "MORE TO PAY" and tax mark "6"; stamp clear to wide margins except just touching bottom right corner, a Fine and rare entire; ex-Nickle, Richardson, Carrington, Wilkinson, Hackmey, shown in "Canadian Philatelist" (vol 56, no 3, p 88),rnPrepaid at the Cunard rate, but apparently arrived too late and was directed via the U.S. Collins Line which required and extra 6d postage which was collected on delivery. 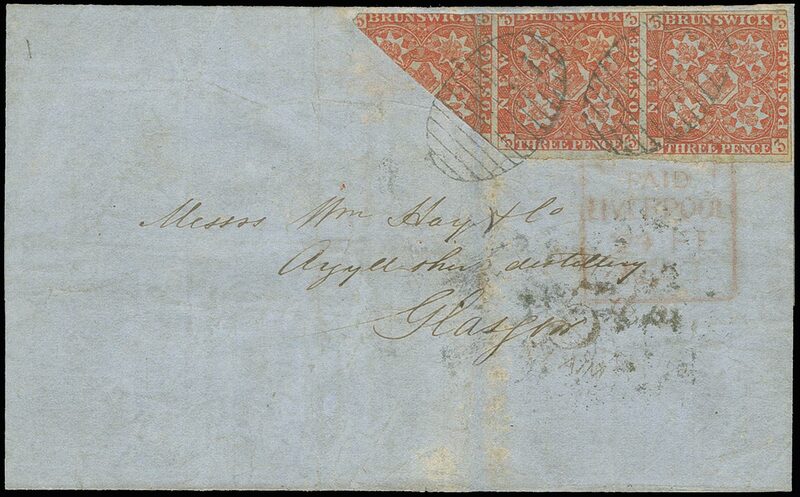 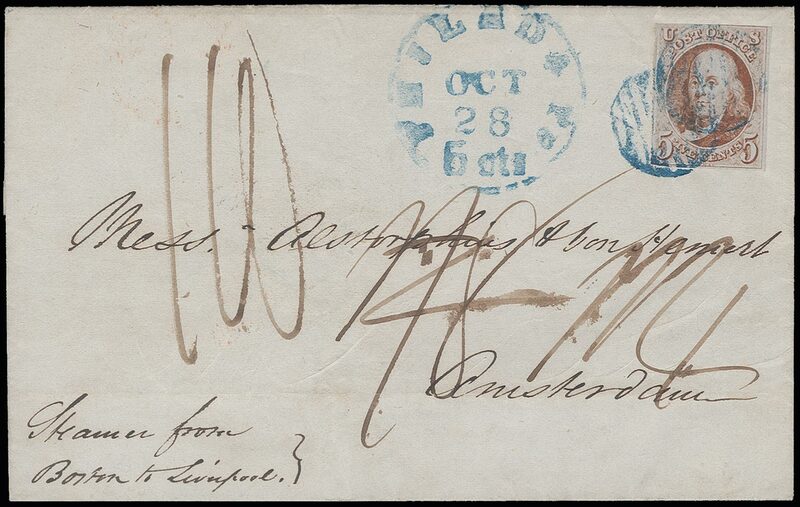 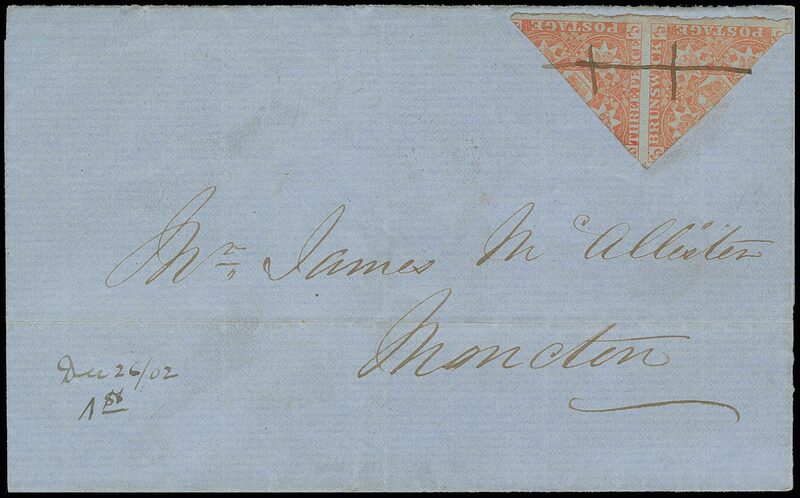 A rare example of the so-called "Crimean War rate" and the only example sent short paid. 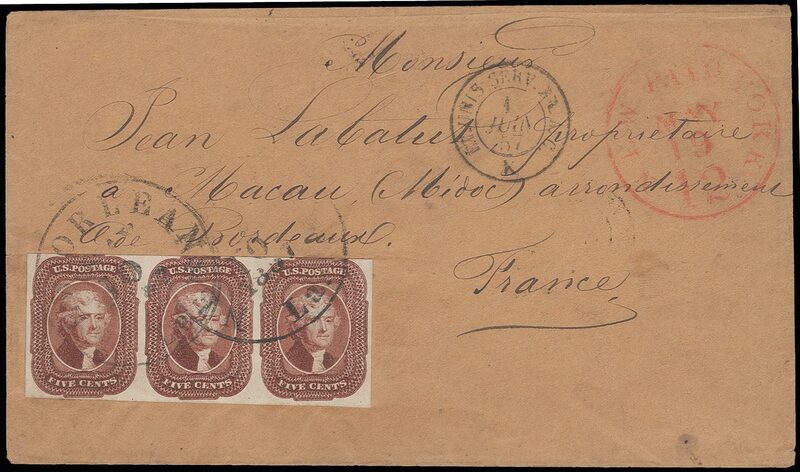 2, 1851 6d Slate violet, horizontal strip of three tied to folded letter sheet addressed to France by target cancels and red boxed "COLONIES & c. ART 12" handstamp, New Carlisle Gaspe DE 1 1851 cds, backstamped Chatham N.B, Peticodiac and Sackville (New Brunswick), ms "15" (decimes) due in France,, stamps with strong laid lines and clear to ample margins except in at lower left, the cover skillfully repaired in the folds, a faint vertical crease affecting the left stamp; otherwise Very Fine; the largest recorded multiple of the 6d on laid paper on cover; ex-Nickle, Wilkinson, Hackmey; shown in Arfken, Leggett, Firby & Steinhart (p 282), "Gems of Canadian Philately" (p 13)rnThe franking paid the 3d overland rate to Nova Scotia and the colonial packet rate of 15d currency from Halifax to Britain. 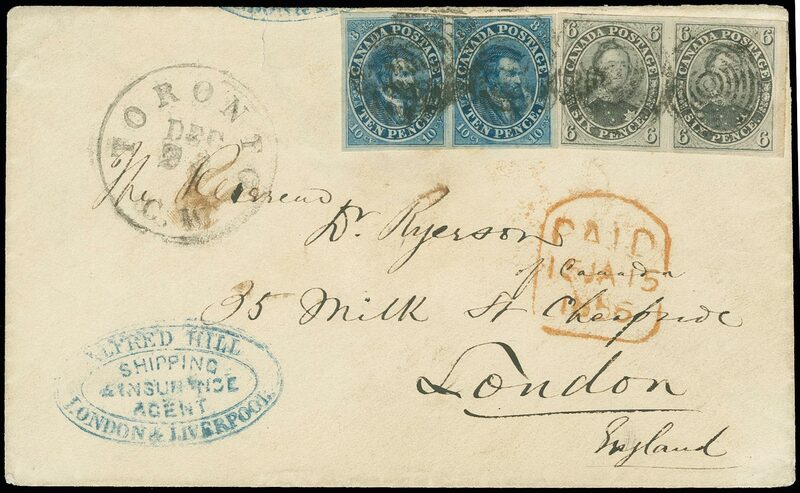 The mail was closed at the Sackville exchange office and the letter carried on vessel "Asia" which arrived at Liverpool 20.12.1851. 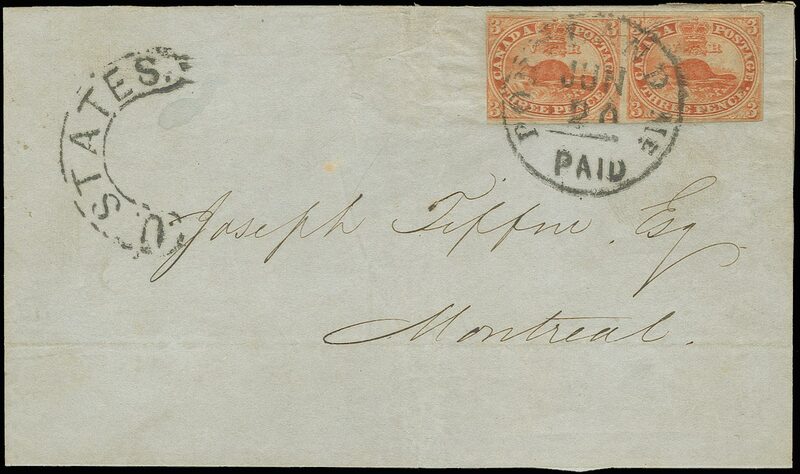 This is the only known cover to a foreign country using this routing through the Maritimes. 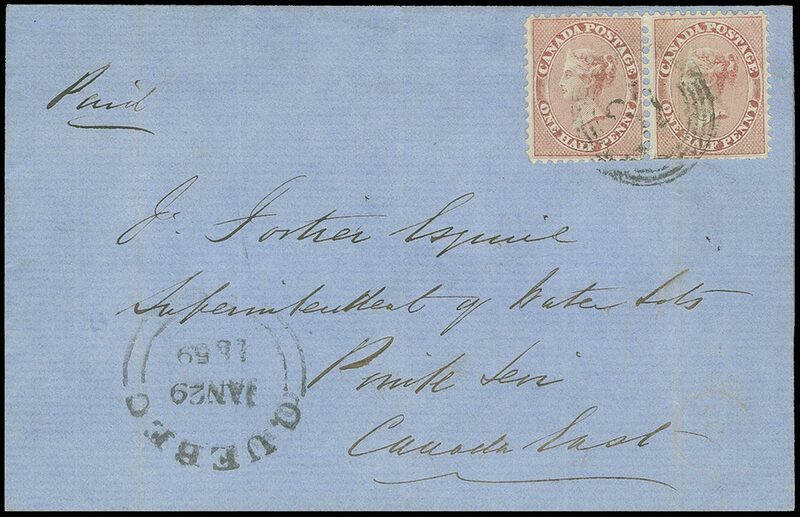 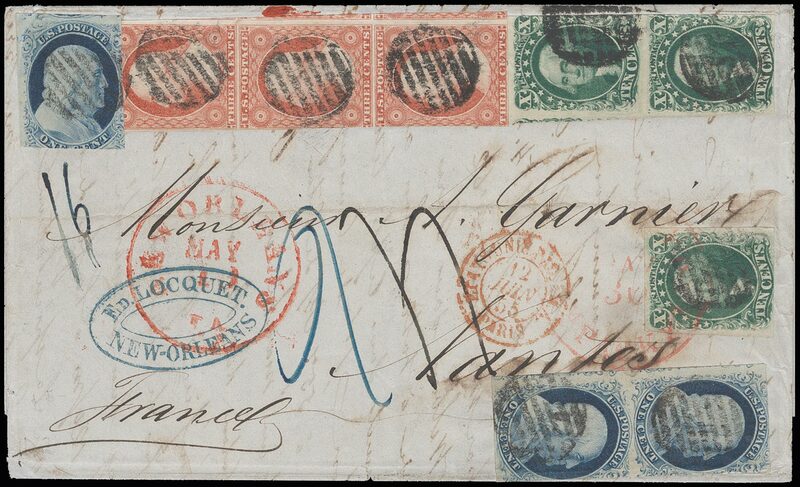 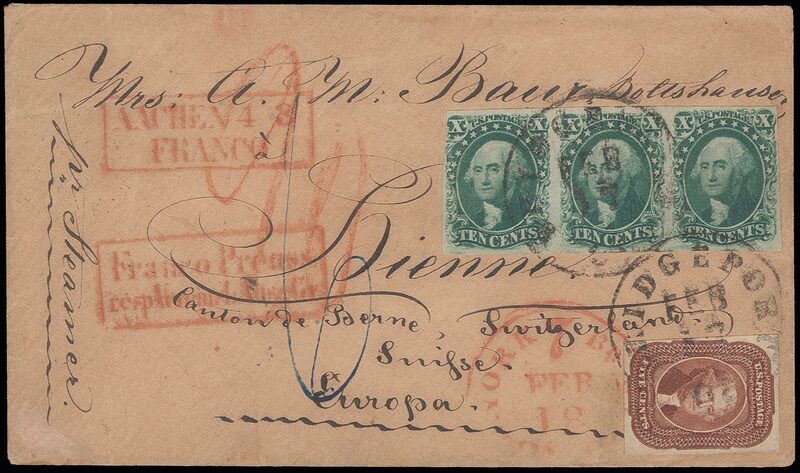 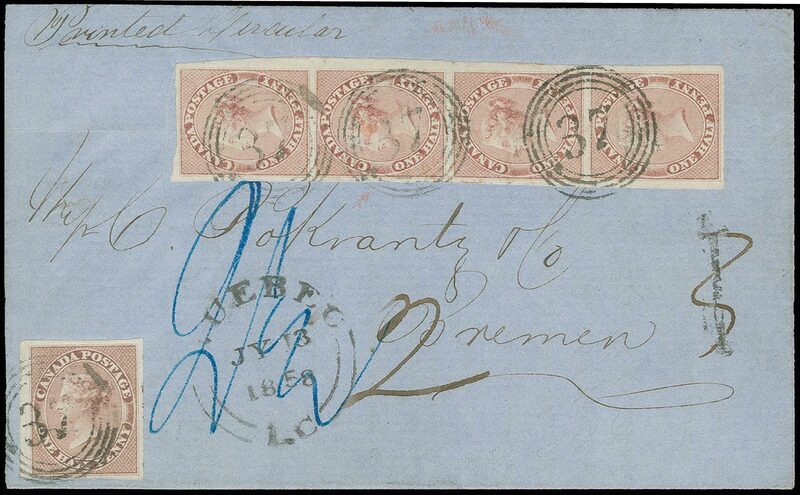 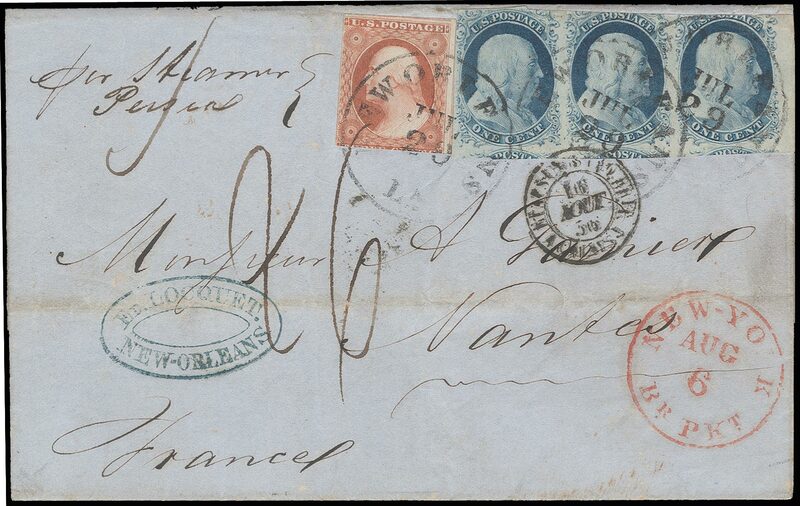 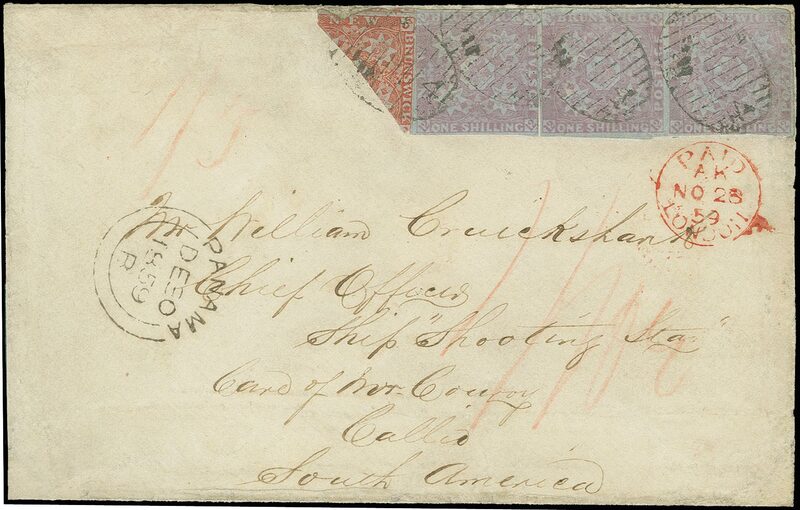 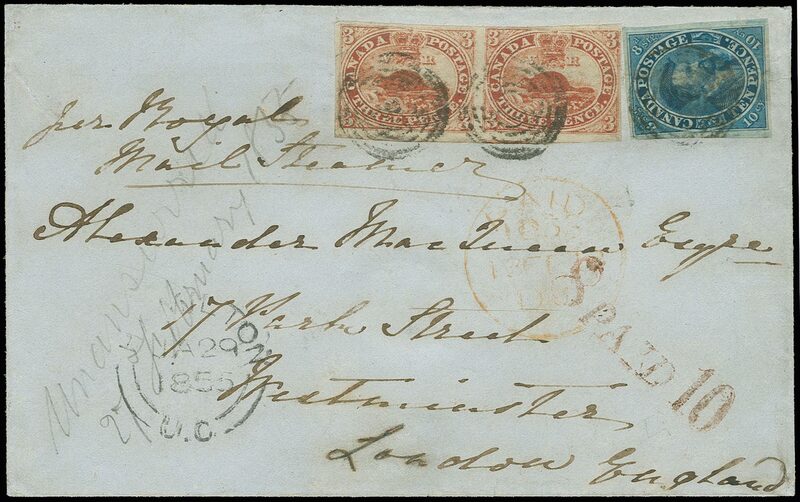 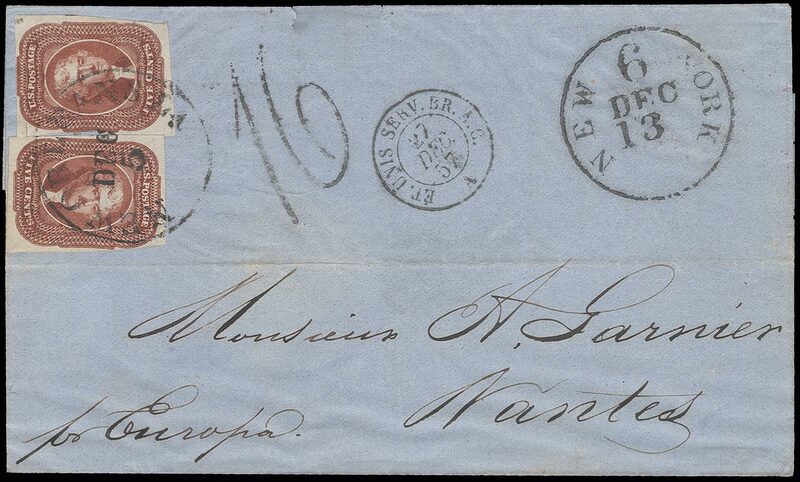 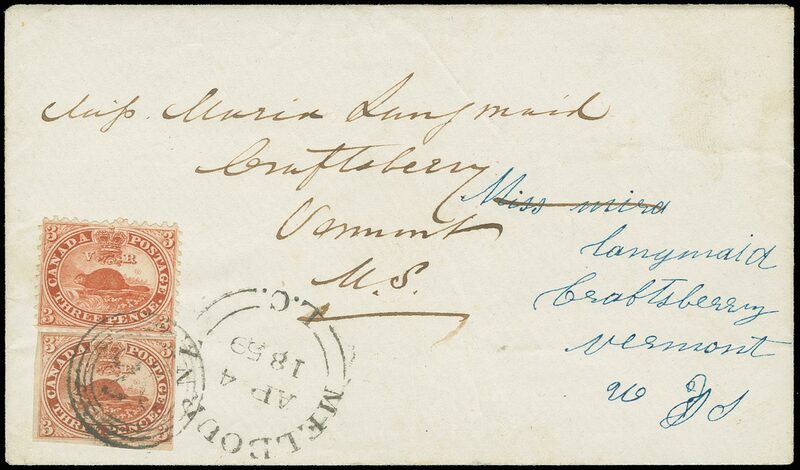 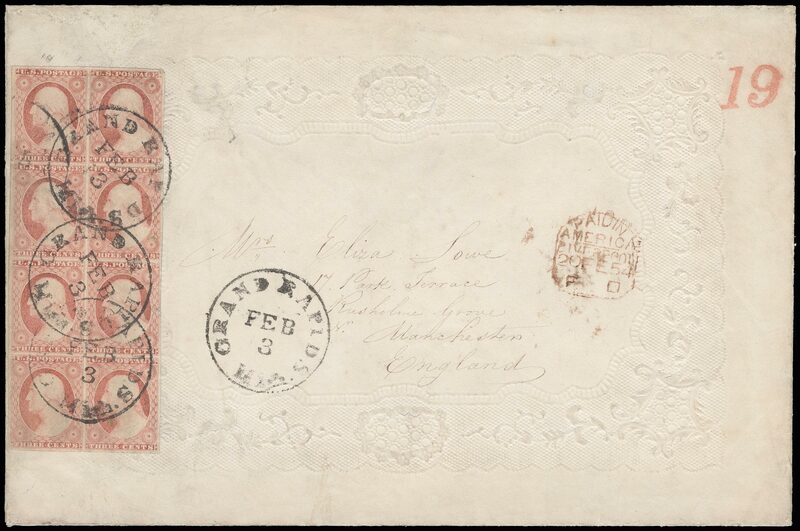 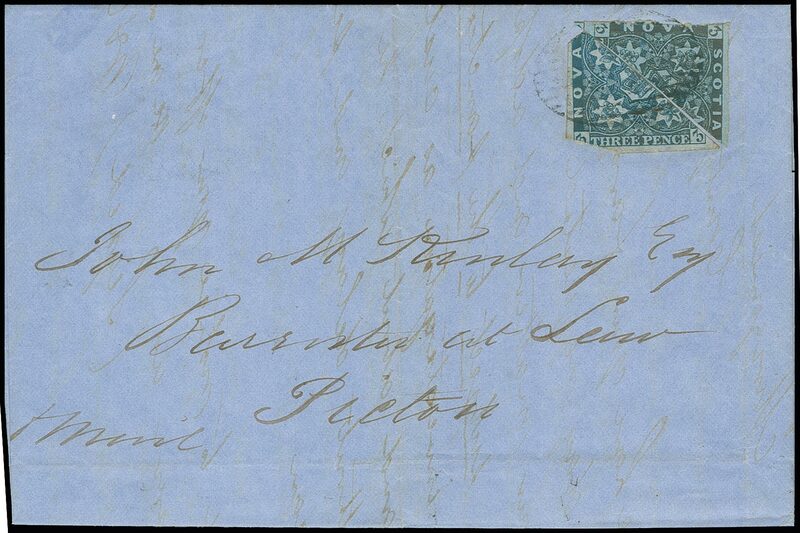 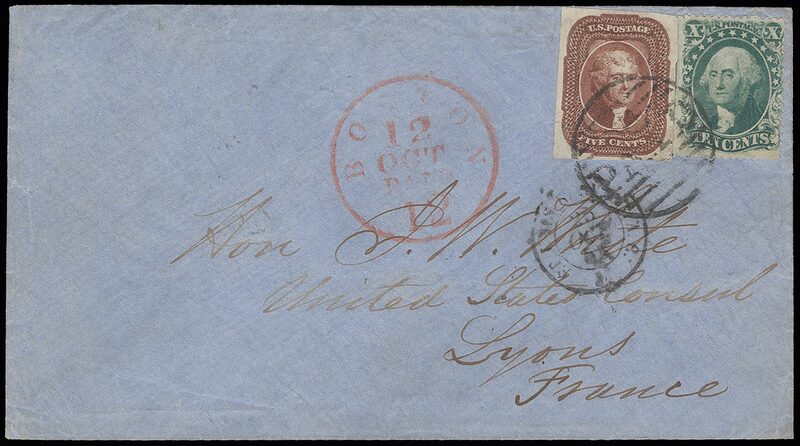 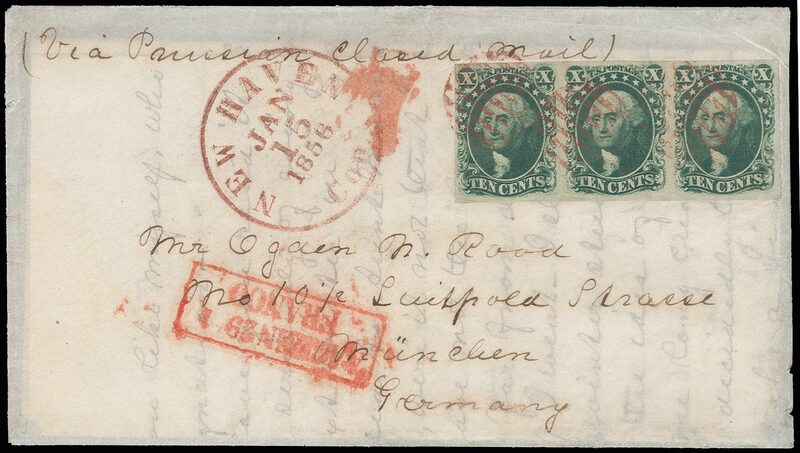 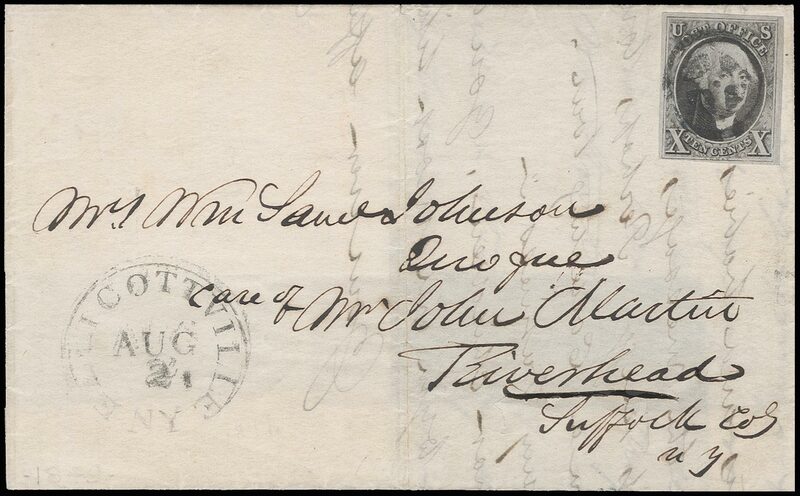 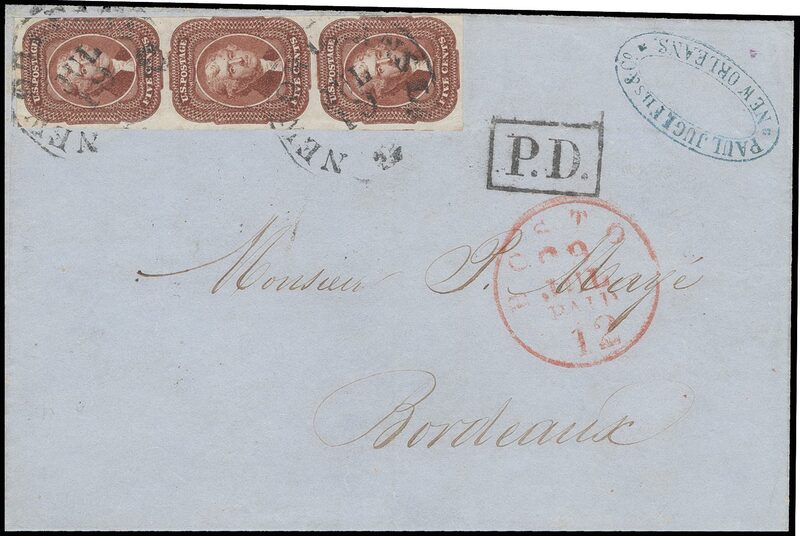 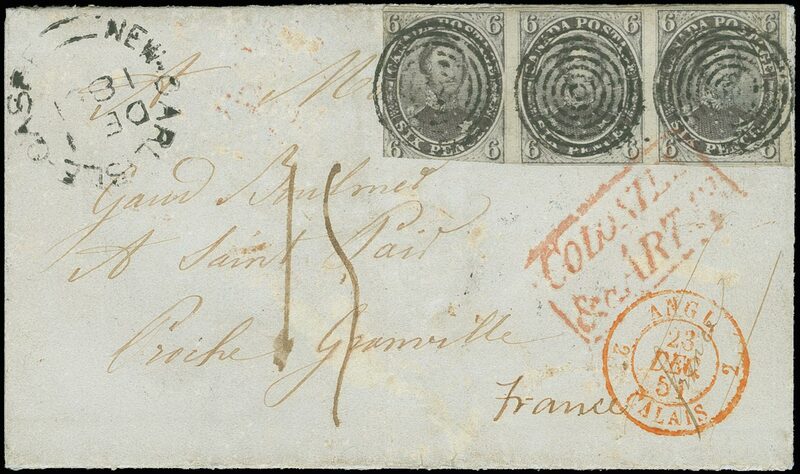 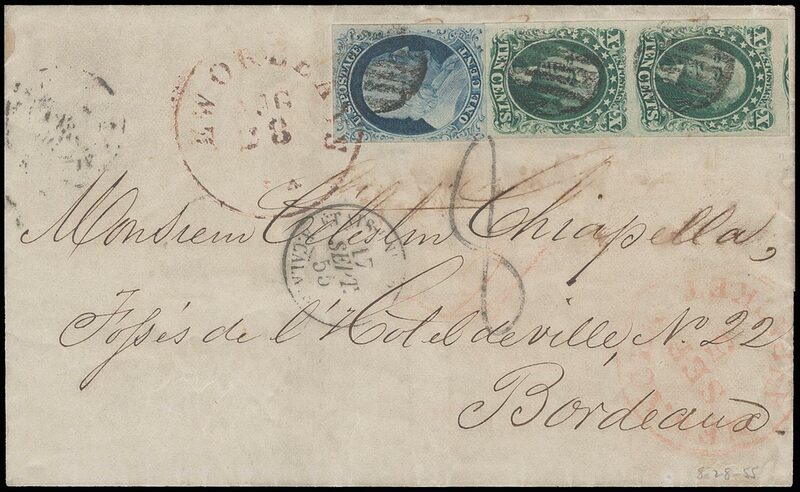 5b, 1855 6d Greenish grey, with 10d Blue (Scott 7) tied to registered triple-rate envelope addressed to France by black target cancels, adjacent red Toronto C.W. 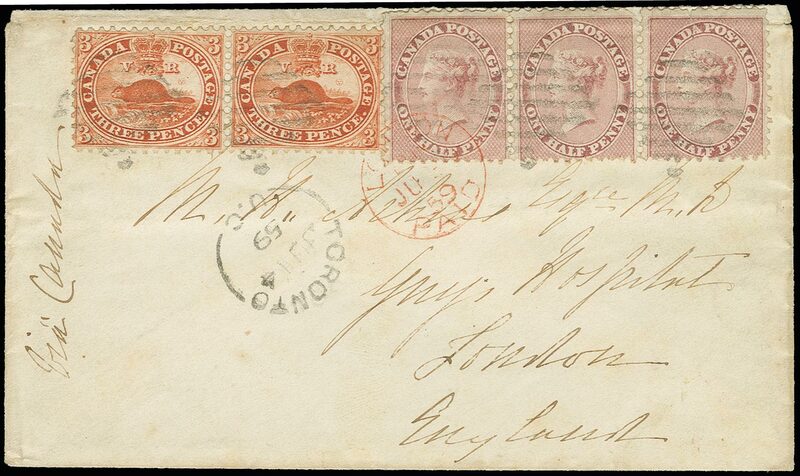 Paid MAR 28 1857 cds and red "PAID", red circled "PD" plus Canadian, British and French register marks, incorrect manuscript tax "6" crossed out as paid, numerous British and French backstamps, 6d clear to huge margins though just in at upper left, 10d margins in places, small part of backflap missing, otherwise Very Fine; a fascinating and unique cover being the only stamped registered triple weight cover to a destination other than the US or UK; ex-Meroni, Reford, Fairbanks, des Rivieres, Richardson, Wilkinson, Hackmey, illustrated in Arfken, Leggett, Firby & Steinhart (p 287) and "Gems of Canadian Philately" (p 24)rnA new Anglo-French agreement went into effect on 1 Jan 1857 and increased the British Packet charge from 8d-10d Sterling (10d-12½d currency) per ¼oz. 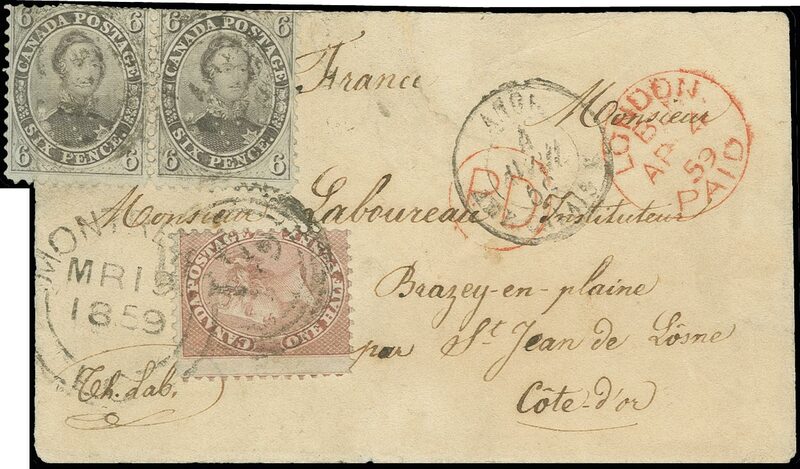 to France and also required registered letters to be fully prepaid. 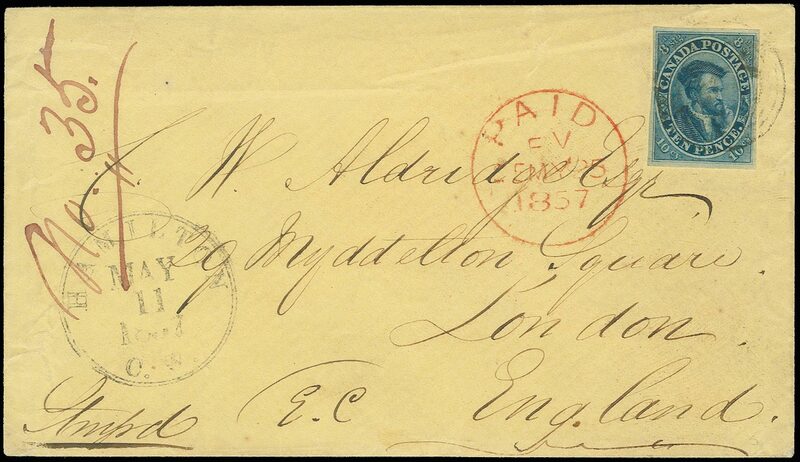 There was some confusion in comparing 1851 Allen and Cunard Line rates with newly adjusted 1855 Cunard rate. 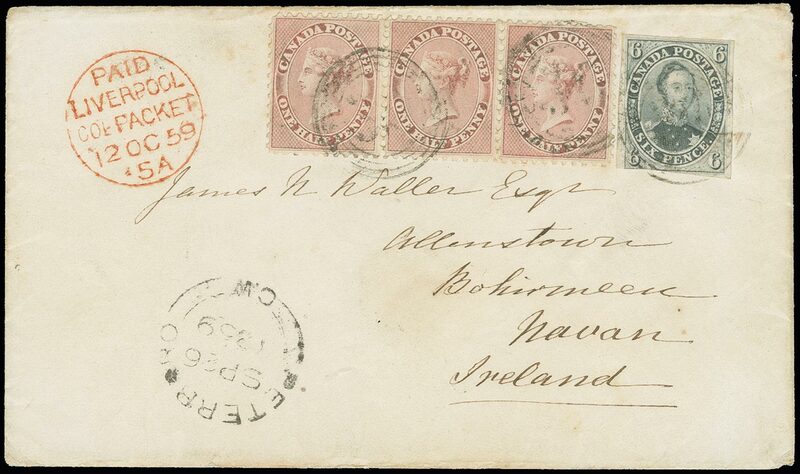 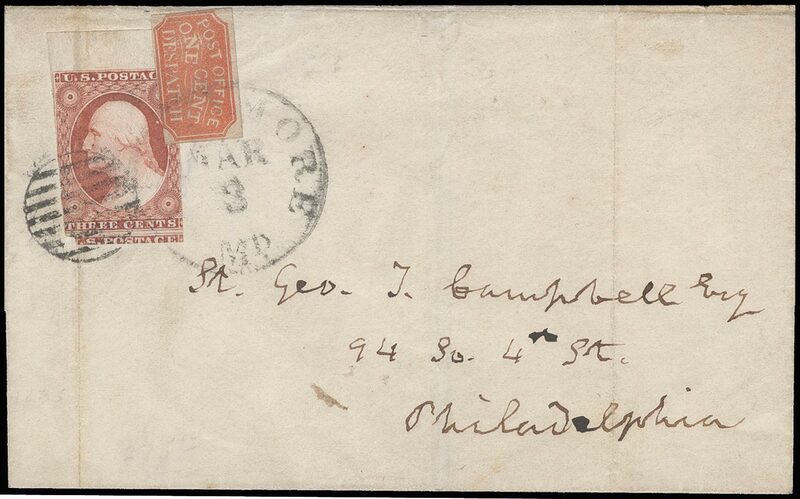 The sender of this cover or the local postmaster was unsure of the rate and it's a plausible explanation why the postage for this was paid partly in stamps and partly in cash. 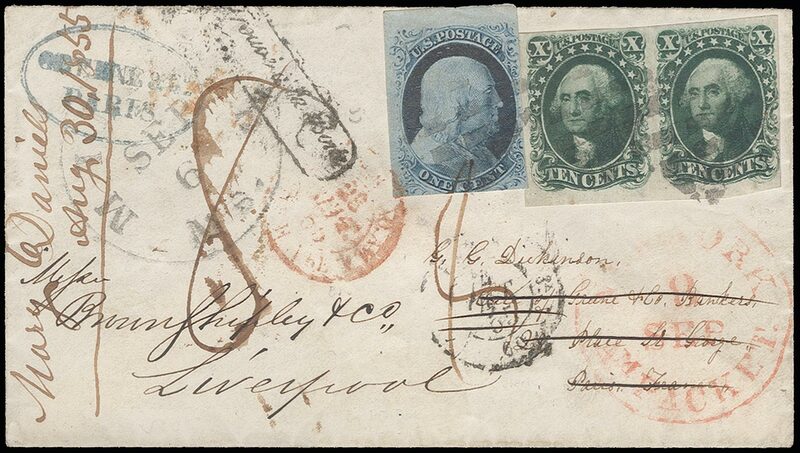 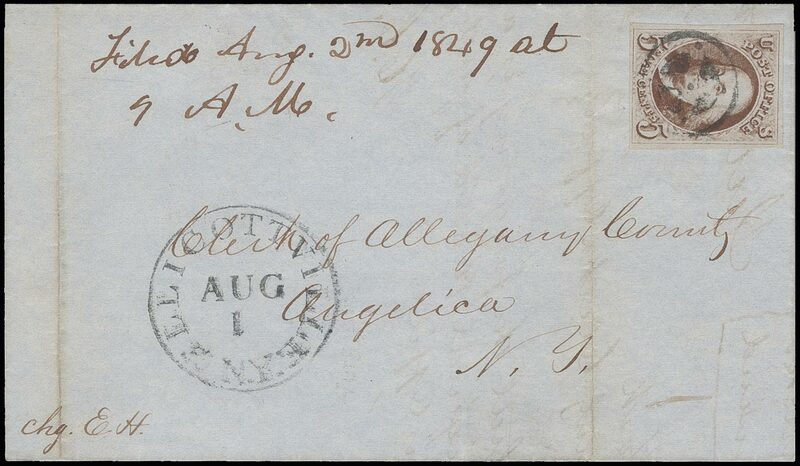 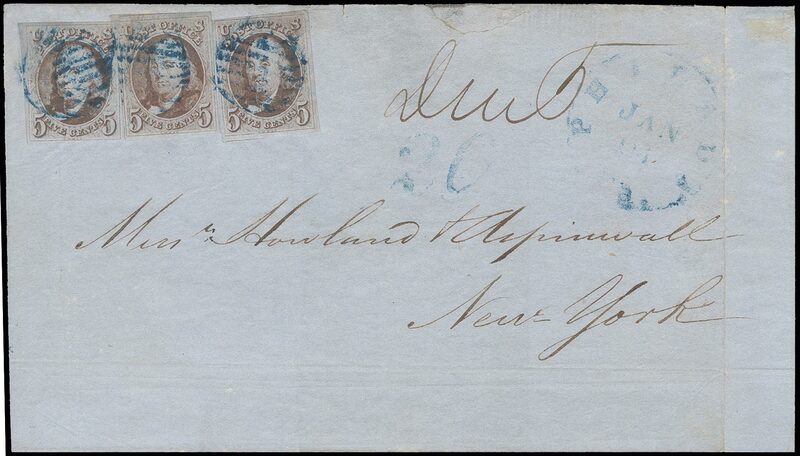 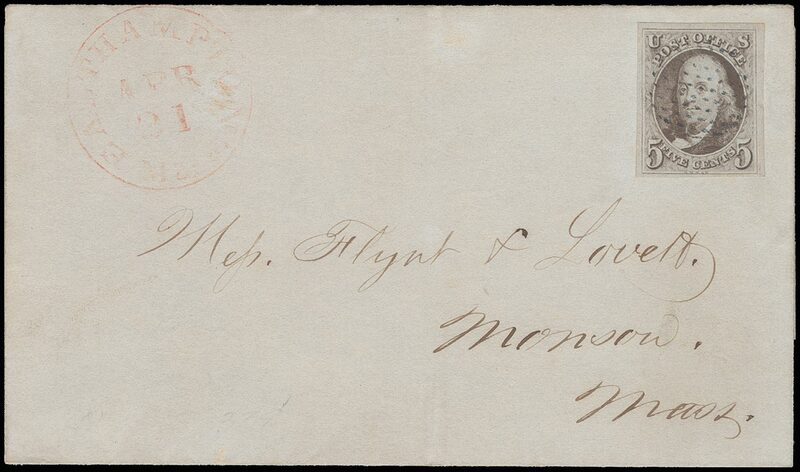 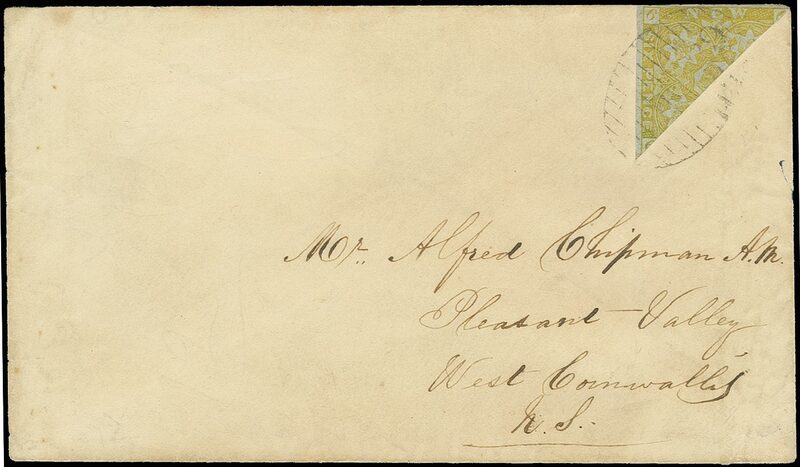 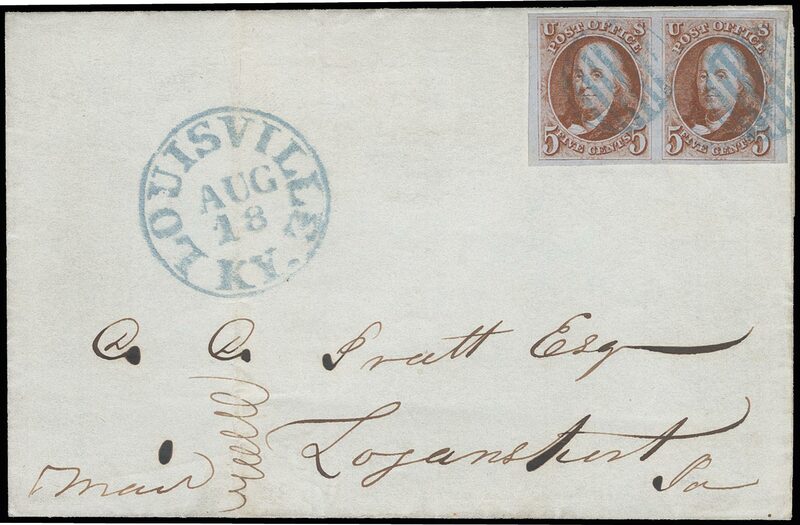 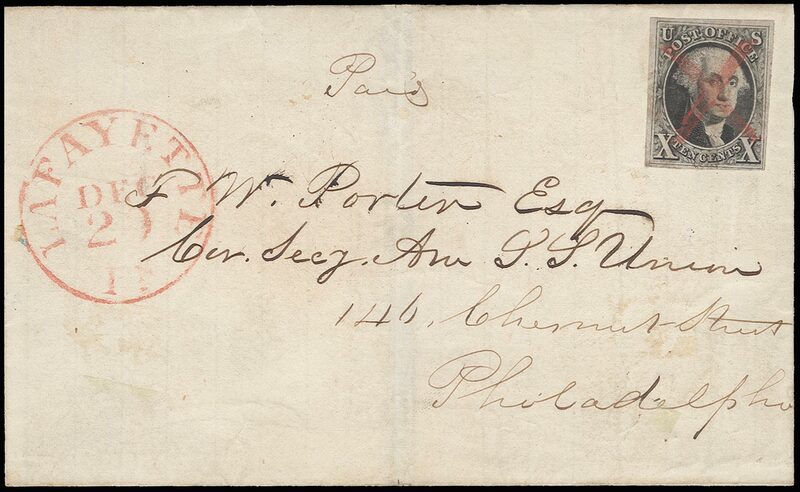 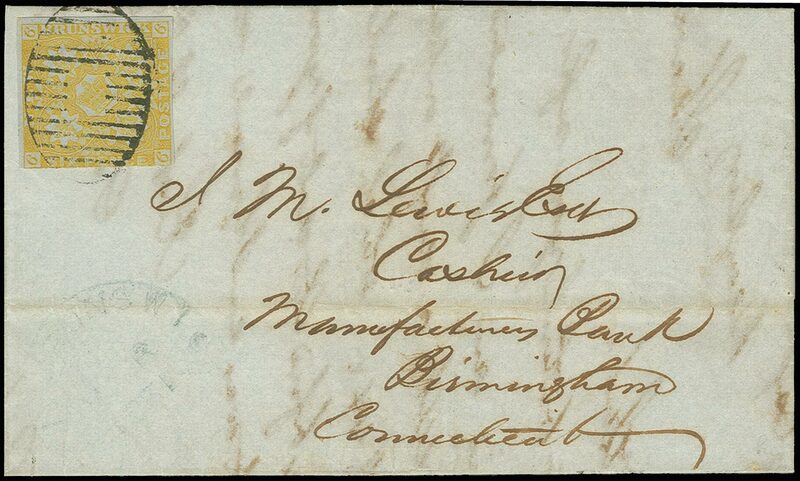 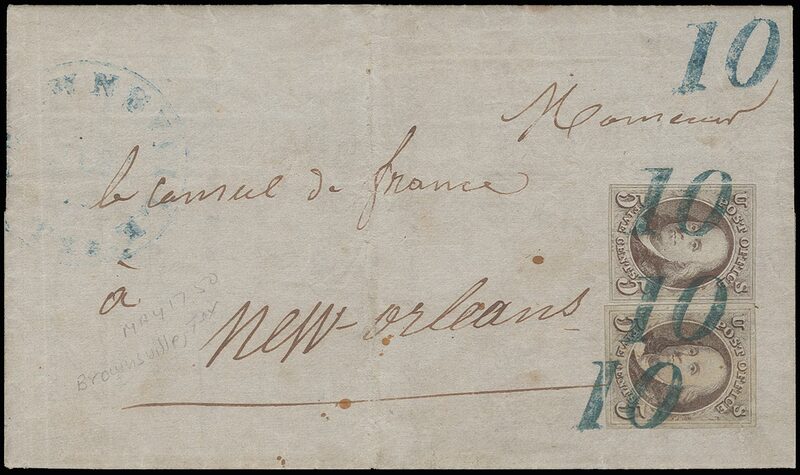 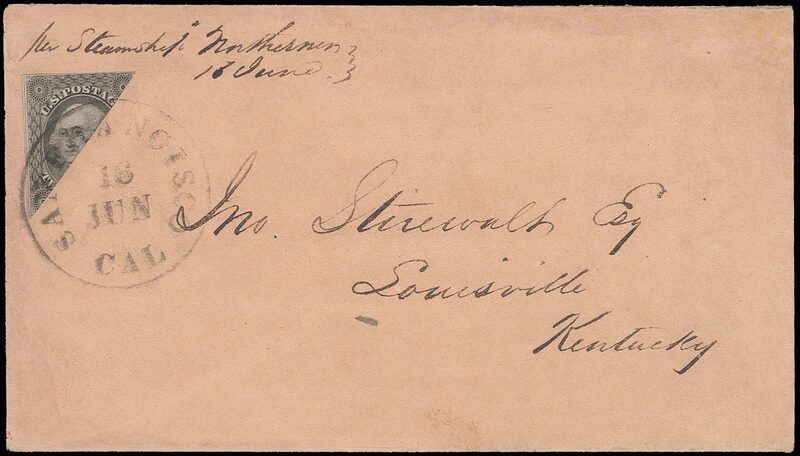 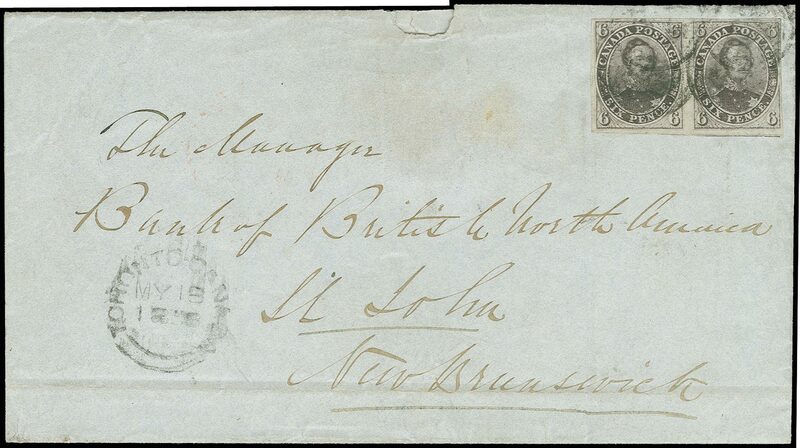 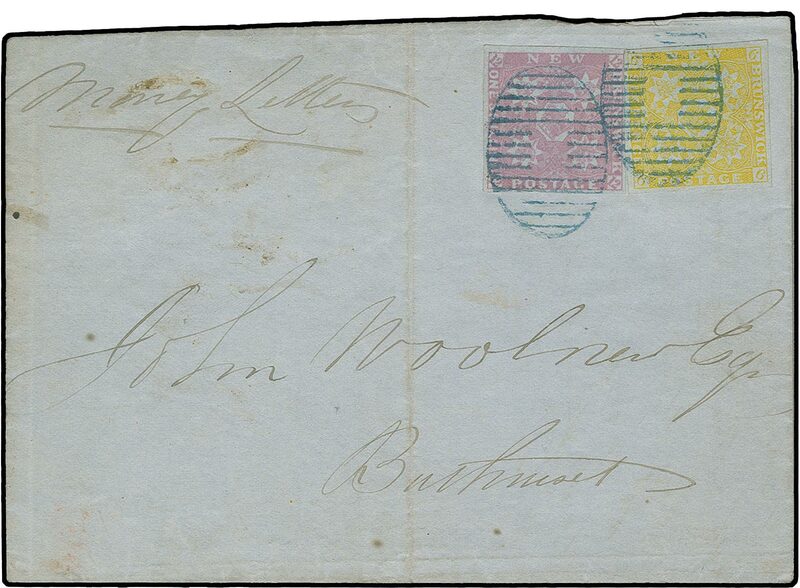 17a, 1851 12c Black, Diagonal bisect used on cover, top left half tied on envelope addressed to Louisville Kentucky by SAN FRANCISCO CAL. 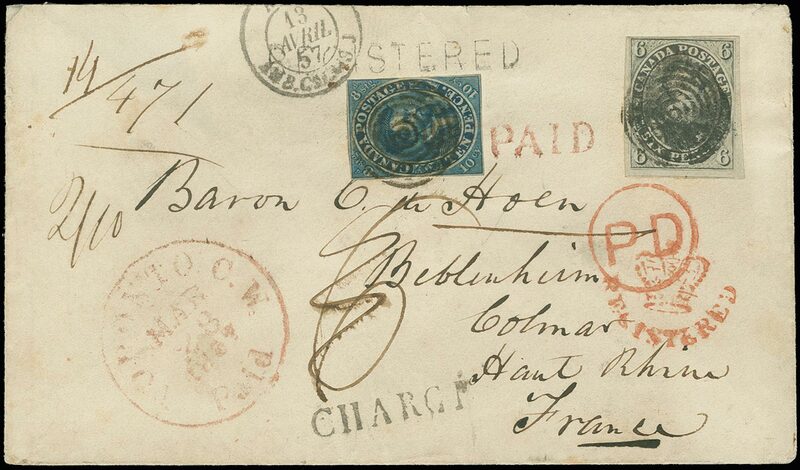 16 JUN cds (1853), endorsed "per Steamship 'Northerner' 18 June"; "cameo" imprint of "F.B.B. 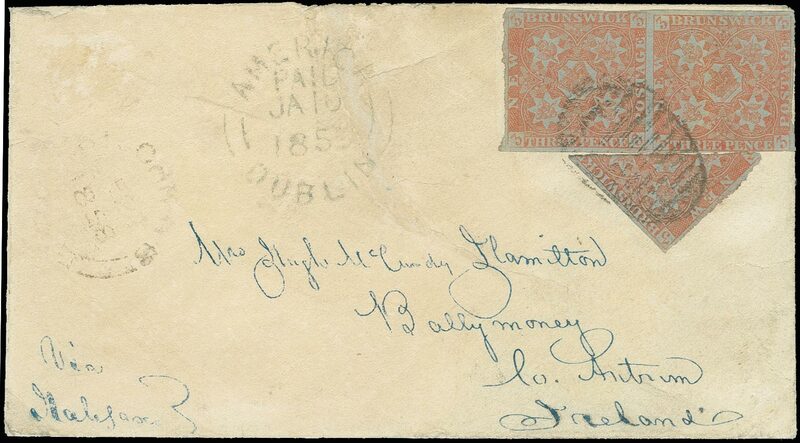 & Co San Francisco" on backflap, stamp full margin at left, just in at top, the envelope repaired in the margins; otherwise Fine and attractive cover; a shortage of 3 c. stamps in San Francisco led to the use of bisected 12c stamps to pay the 6c letter rate from May until September 1853, when the bisects were prohibited in the East.